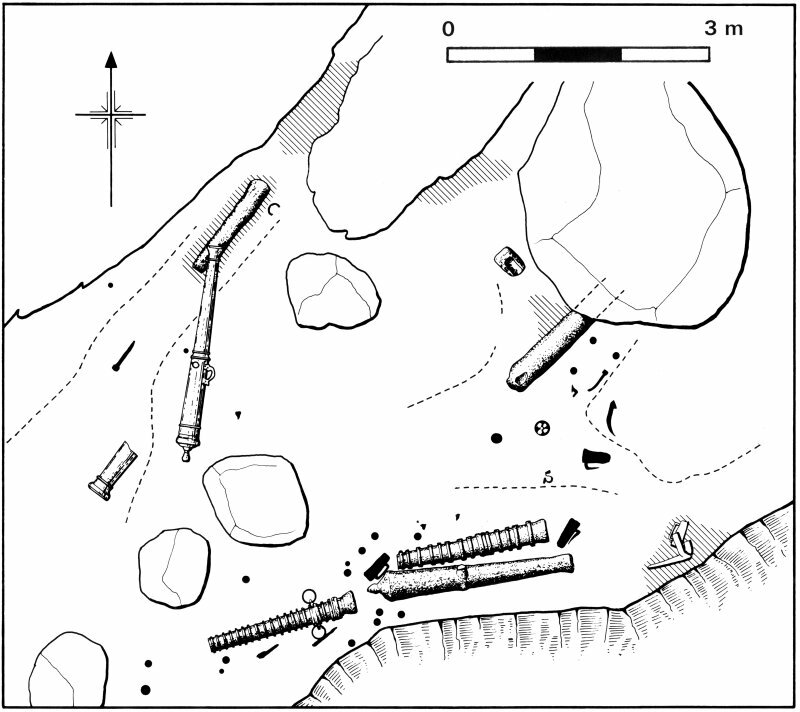 El Gran Grifón wreck-site, general plan, showing the phases of excavation. Section through the main gulley, recorded in 1977. Stratigraphic key: (1) loose overburden, mobile in storms; (2) normally stable overburden, mobile only in extreme storms, and stained by iron corrosion; (3) top surface of concretion with bronze media culebrina on top and in immediate contact with it; (4) stabilised iron concretion; (5) stabilised organic sludge; (6) stabilised shingle, presumably pre-1588. 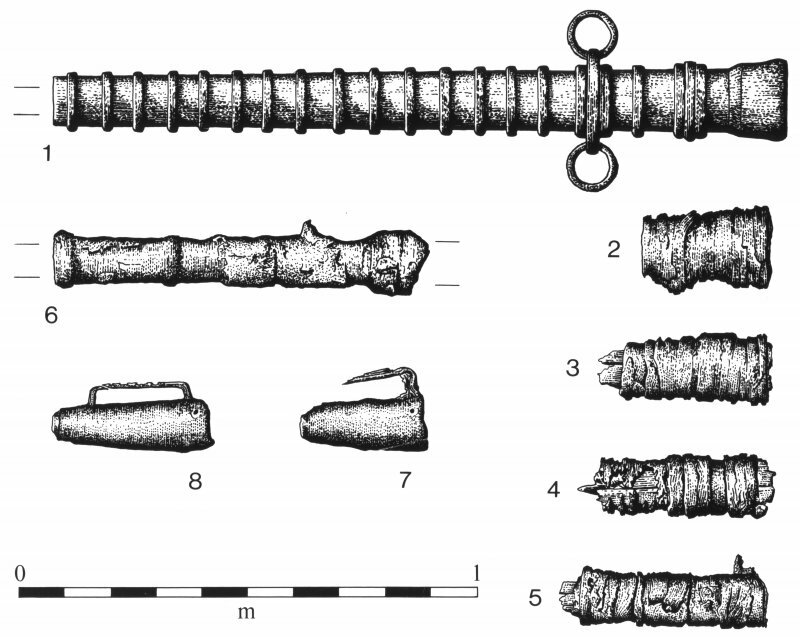 Bronze media culebrina (top), recovered in 1977, with broken muzzle end recovered in 1970. Note the off-centre bore. Below, media sacre, recovered in 1970. 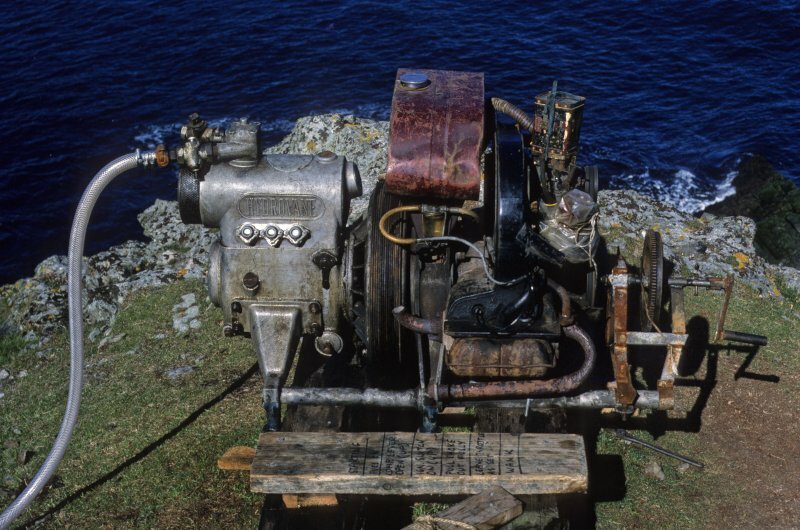 The airlift compressor and hose set up on the cliff-top by Tony Long. 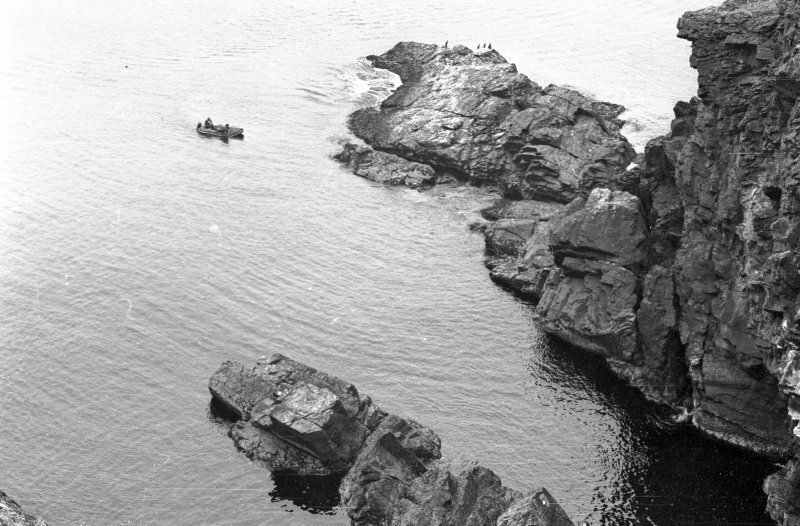 Sheep Rock in the background (1977). The airlift, in three sections, ready to be transported to the site (1977). 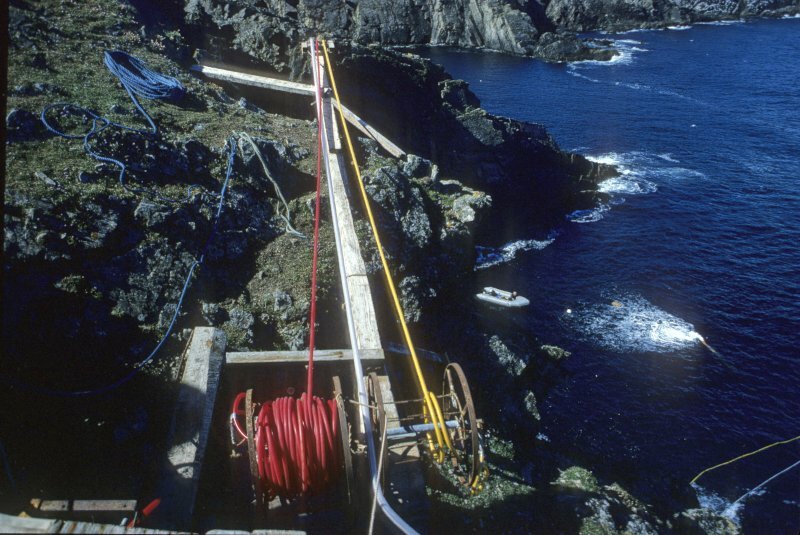 The gantry used to control the dropping of air-hoses to the site and to keep them clear of the cliff-face. The boat and functioning airlift can be seen below, to the right (1977). 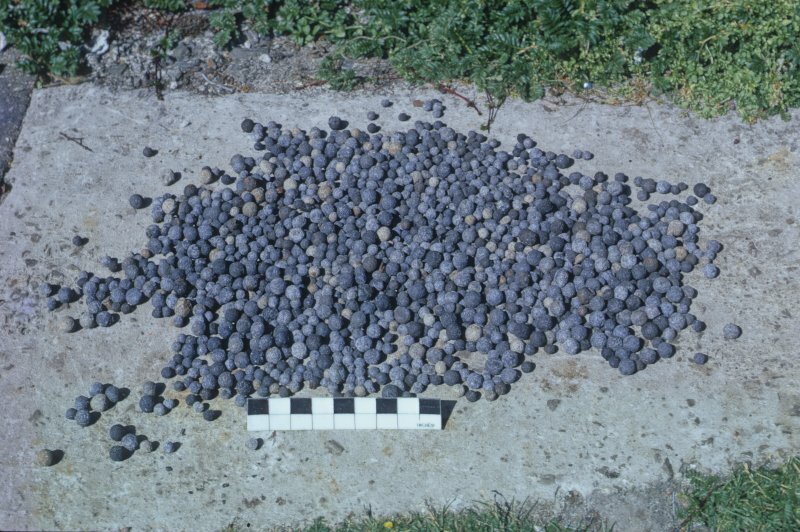 A sample of lead musket and arquebus bullets from the wreck (1977). Scale in inches. 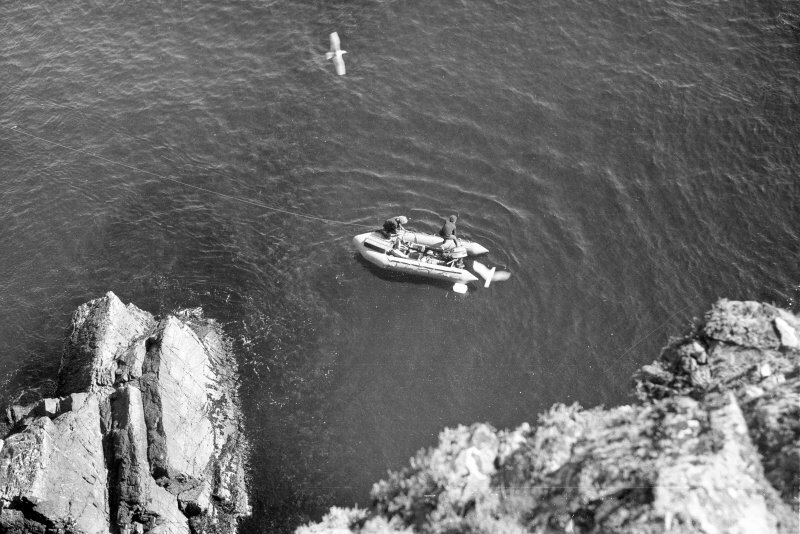 The expedition boat over the wreck-site (1970). Wrought-iron barrel of a breech-loading swivel-gun (falcon pedrero) with two stone balls of appropriate calibre (1977). Remnant of wrought-iron breech-block (interior). 1977, scale in inches. 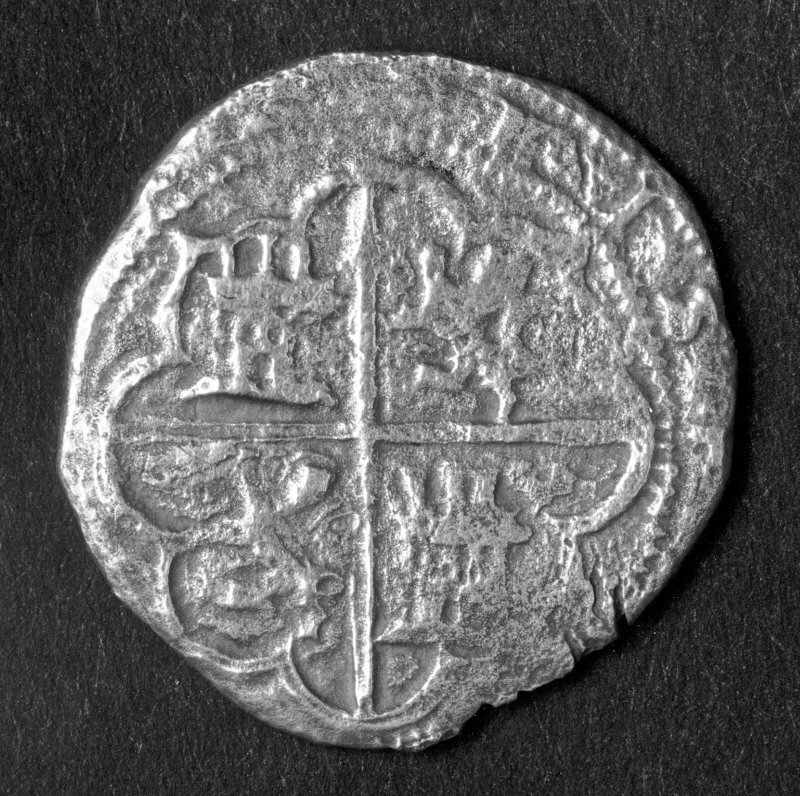 Silver 4-real coin of Philip II minted at Toledo (reverse). 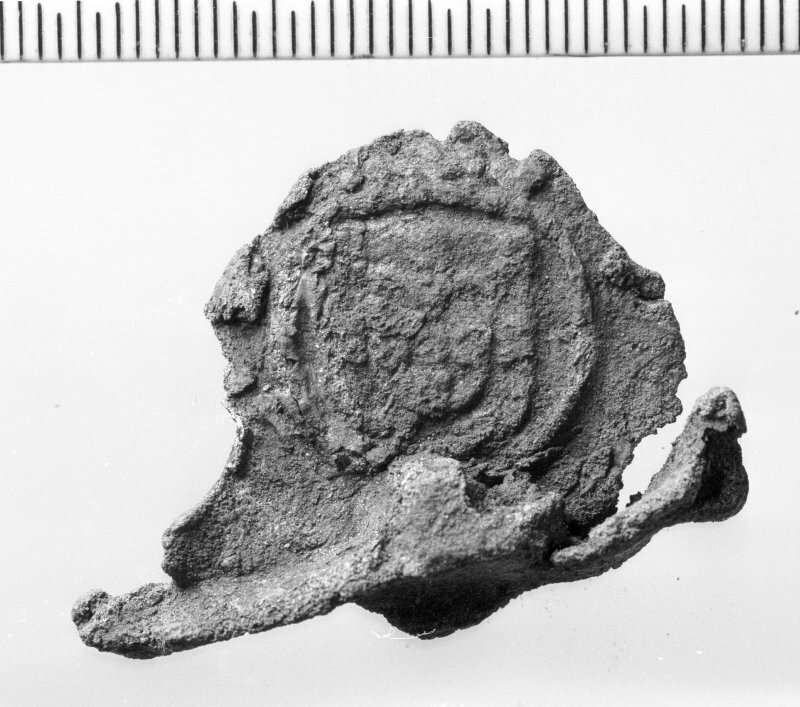 Reverse of the lead seal, showing , within a circle (possibly crowned), a shield within a shield, perhaps the arms of Portugal? Scale in millimetres. The eroded sectioned breech end of an iron gun, after cleaning. A quadrant of metal has been cut from the breech end to reveal the chamber profile (1974). The iron ball is in place, as is the hemp wadding on either side of it. Scale in inches. 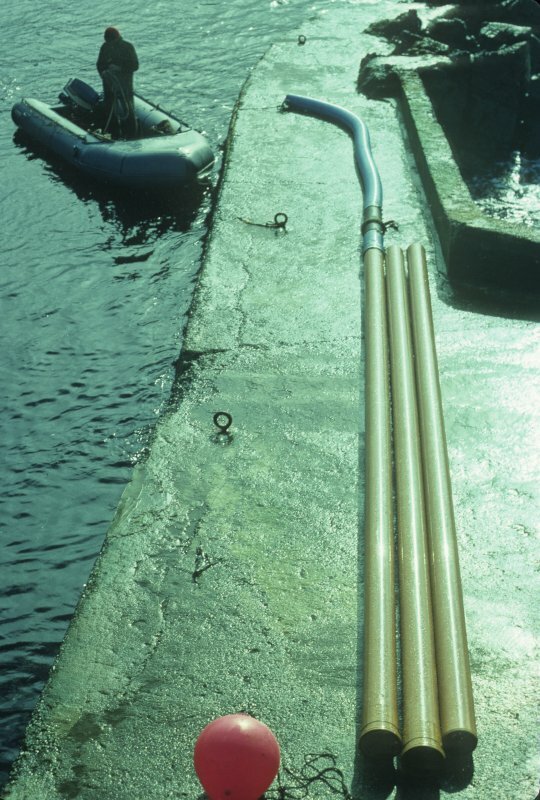 The bronze media culebrina is hoisted ashore (1977). 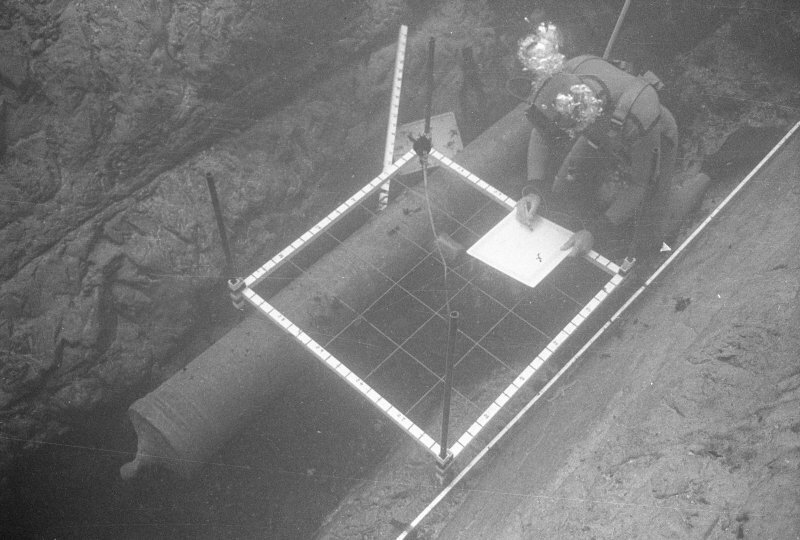 Keith Muckelroy drawing the large anchor, almost certainly belonging to El Gran Grifón, found some 60m to seaward of the main site in a depth of 23m (1977). The dismantled airlift is prepared for transport to the site (1977). 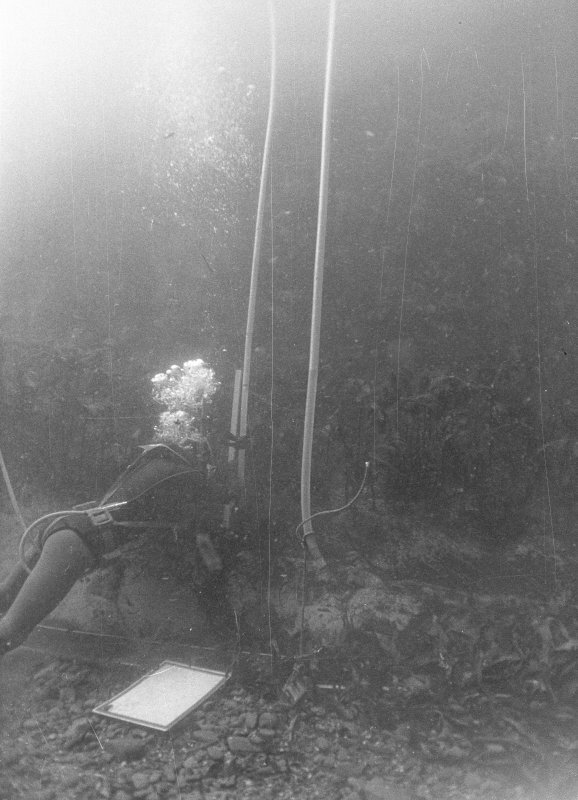 Techniques of working the wreck-site (Martin, 1975, fig.12, p.183). 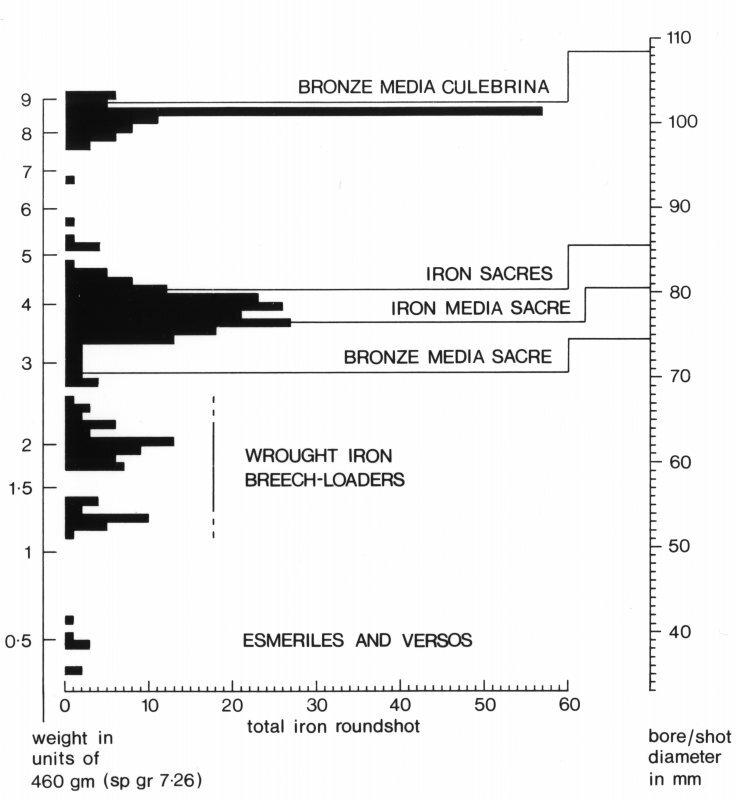 Histogram of iron roundshot numbers and sizes recovered from the wreck. Sample of iron and lead roundshot from the wreck (1970). Scale in inches. Tony Long recording the bronze media culebrina in situ. 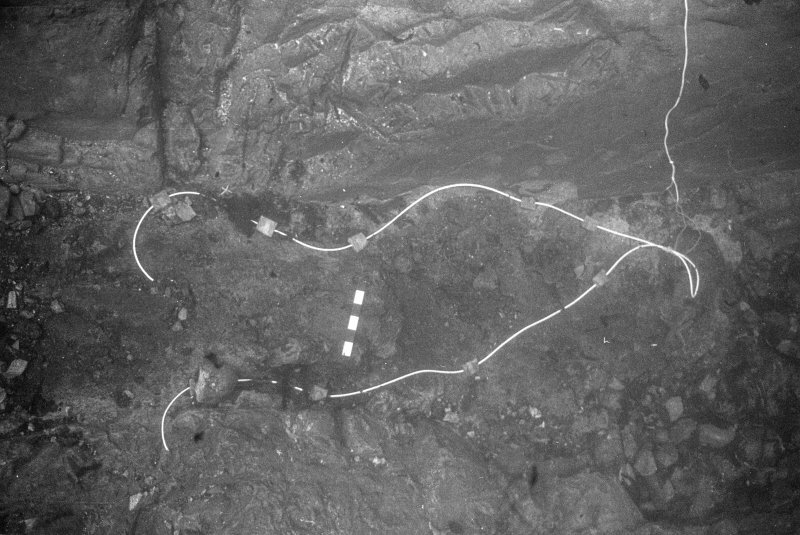 Note the longitudinal datum tape against which the 1-m drawing-frame is positioned (1977). Two wrought-iron breech-blocks. 1977, scale in inches. 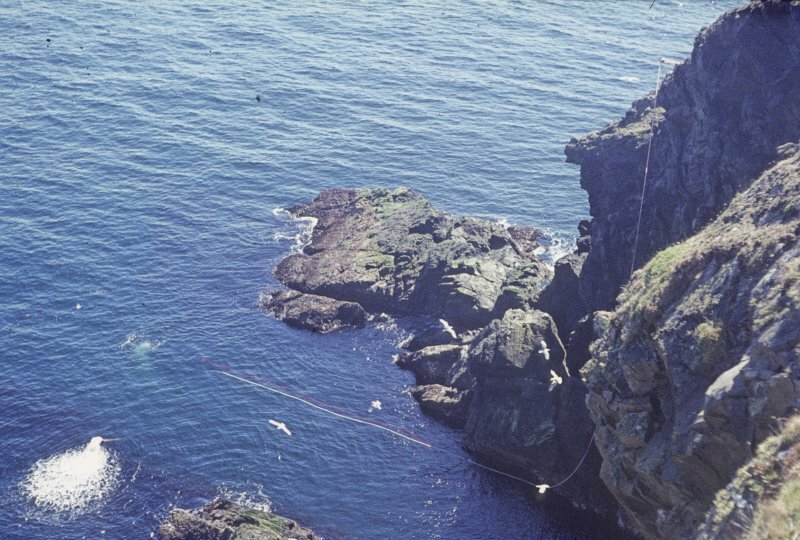 The cliff-top tender paying out the air-hose over our improvised gantry (1977). The operator was always roped for safety. The eroded sectioned breech end of an iron gun, after cleaning. Detail of the iron shot and wadding (1974). 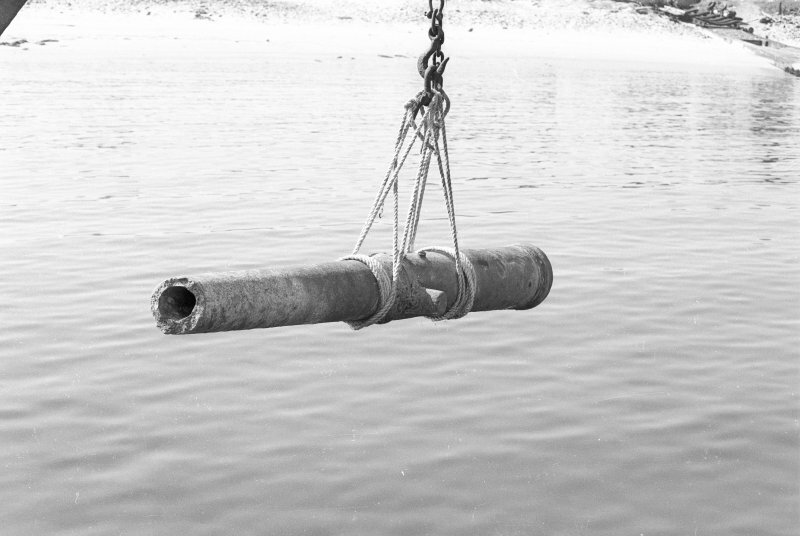 The breech end of a cast-iron gun recovered from a mobile shingle context (1974). Outside view. Scale in inches. 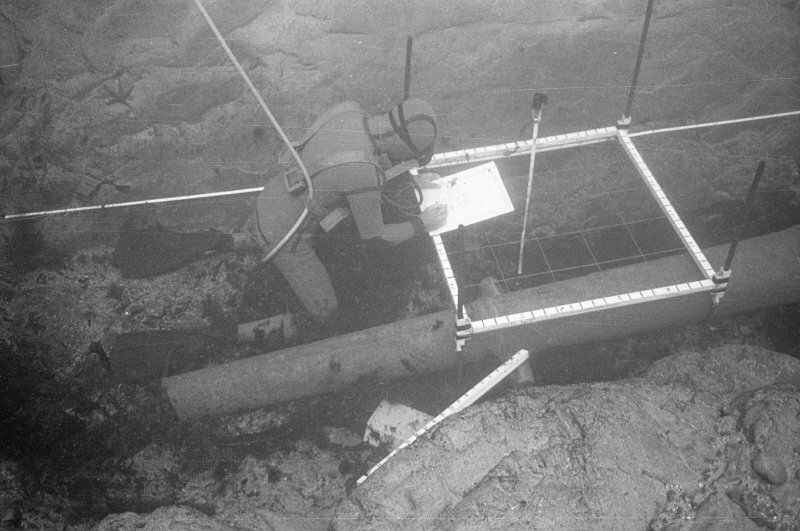 Keith Muckelroy with a template designed to measure the large anchor, almost certainly belonging to El Gran Grifón and found some 60m to seaward of the main site in a depth of 23m (1977). 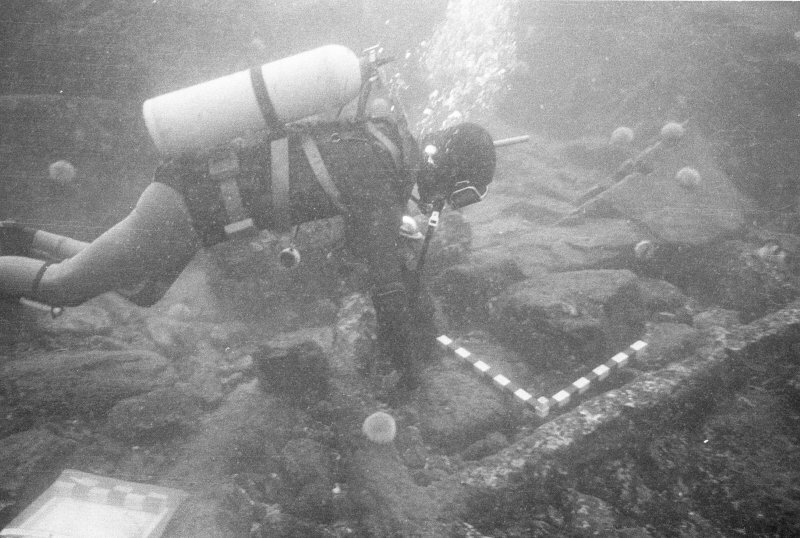 Keith Muckelroy photographing the large anchor, almost certainly belonging to El Gran Grifón and found some 60m to seaward of the main site in a depth of 23m (1977). 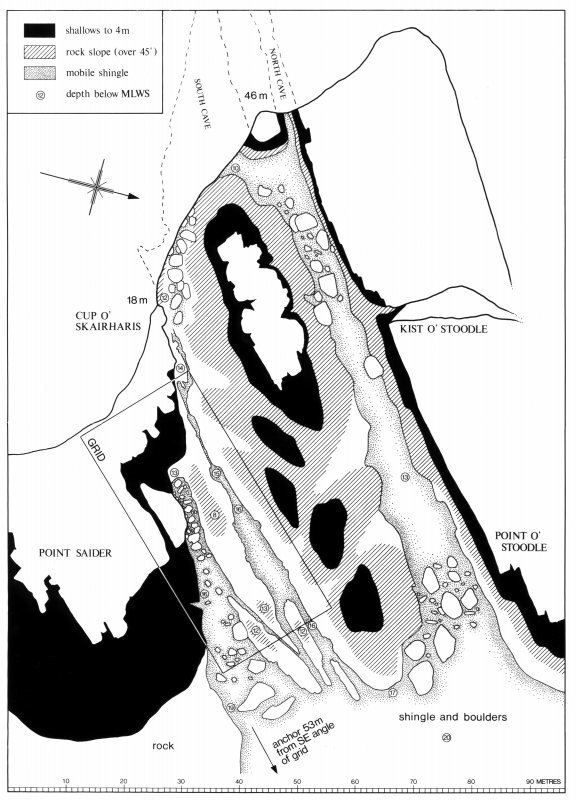 General plan of Stroms Hellier showing the main area of wreckage (labelled "grid") (1977). 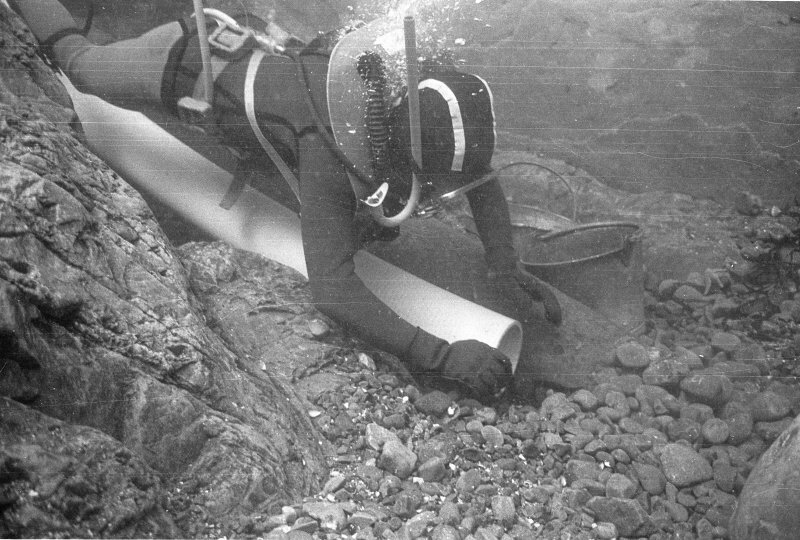 Andrew Fielding uncovers the media culebrina as he removes shingle from the main gulley (1977). Note the depth of the deposit. Stroms Hellier from the cliff-top. One of the ship's wrought-iron rudder-pintles (1970). Scale in inches. 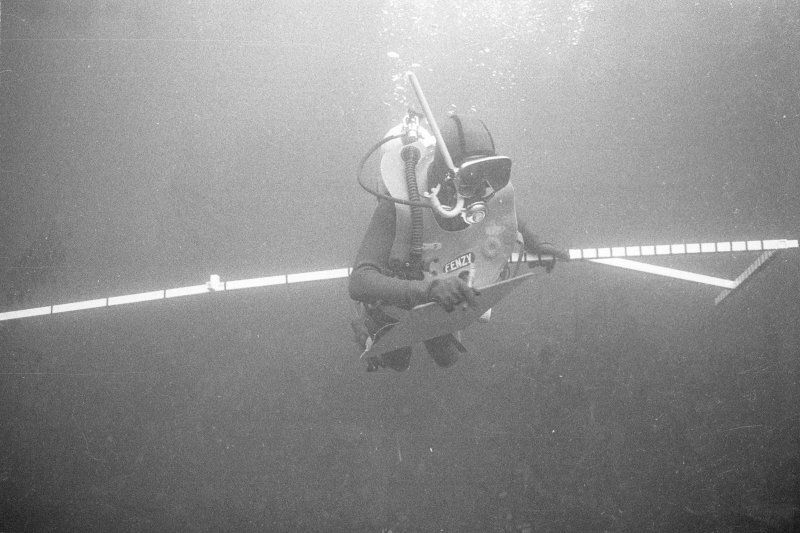 Tony Long establishing datum levels with an inverted air-filled plastic hose (1977). 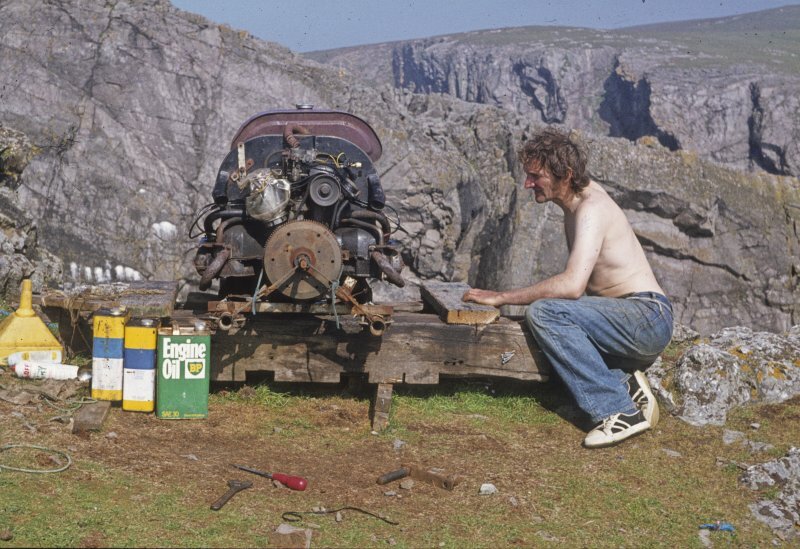 Tony Long tending the compressors at the cliff-top base (1977). 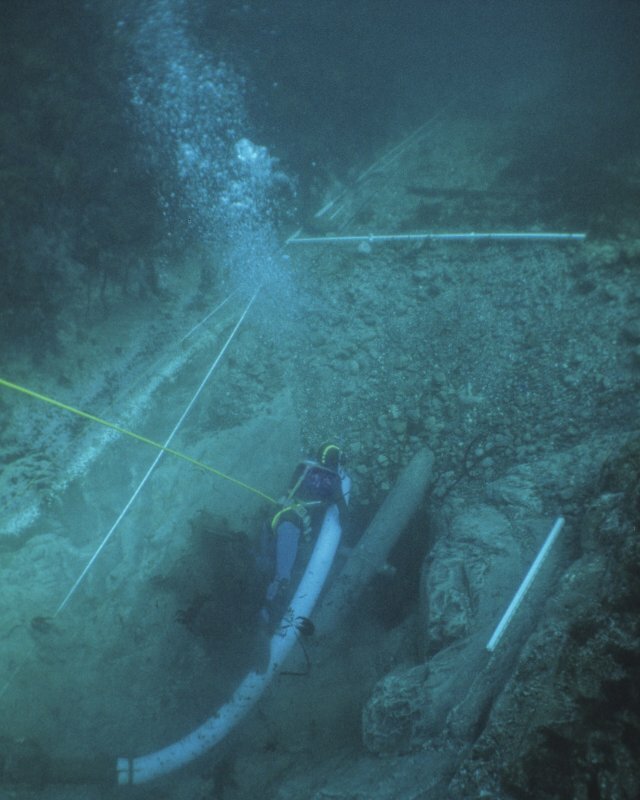 Andrew Fielding removing the deep overburden in the main wreck gulley using an airlift (1977). An area of concretion at the bottom of the main gulley, prepared for treatment with explosives. 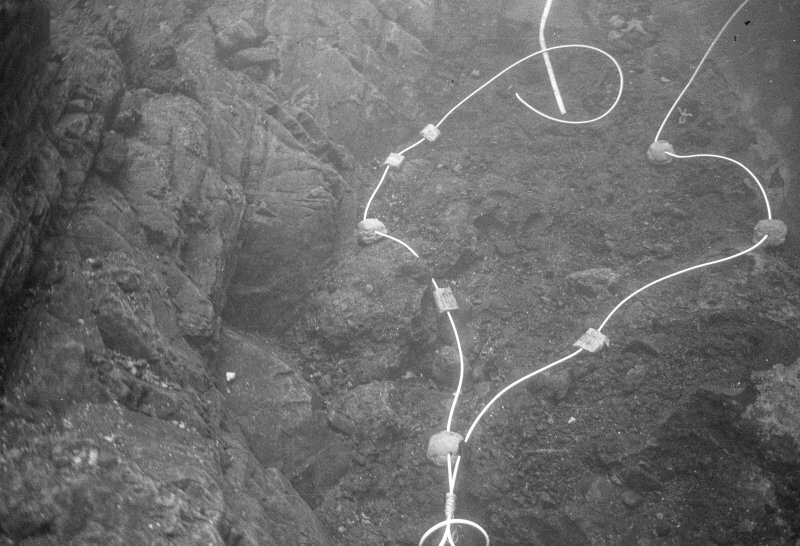 At top right a thin electrical wire will carry an electrical charge from the surface, activating a detonator secured to the looped detonating cord. This will pass detonation along each of the separate runs of cord along which very small charges have been placed. 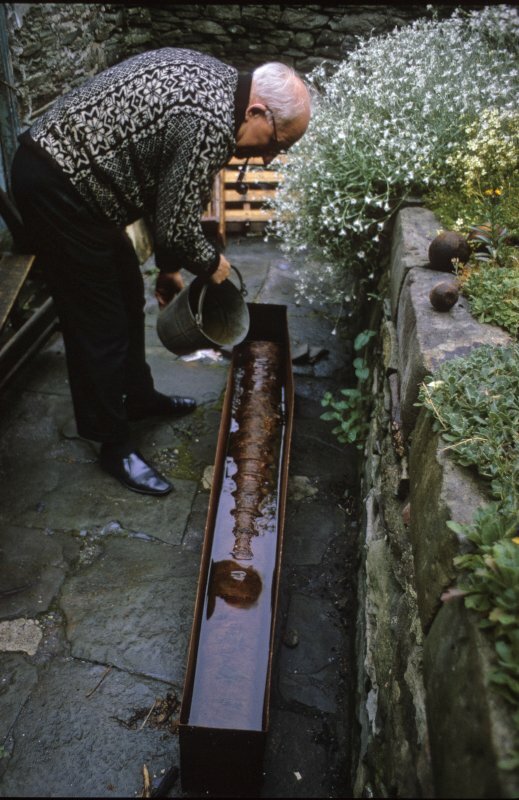 The effect of this treatment was to render the concretion loose enough for excavation without displacing the contexts of items within it (1977). Stroms Hellier (left) with Swartz Geo on the right (1977). 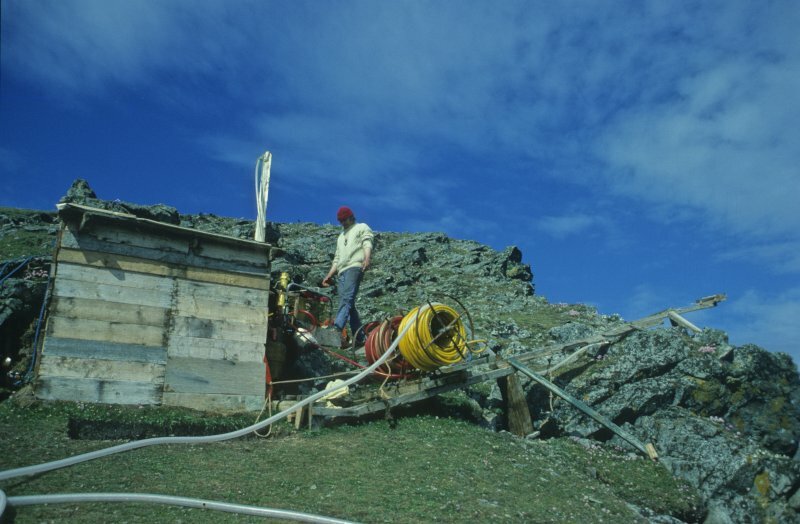 The cliff-top base with (from left to right) the gantry, the air-hose reels, the compressors for the divers' air and the airlift, and the site-hut (1977). The large anchor, almost certainly belonging to El Gran Grifón, found some 60m to seaward of the main site in a depth of 23m. Plan of the 1970 excavation. 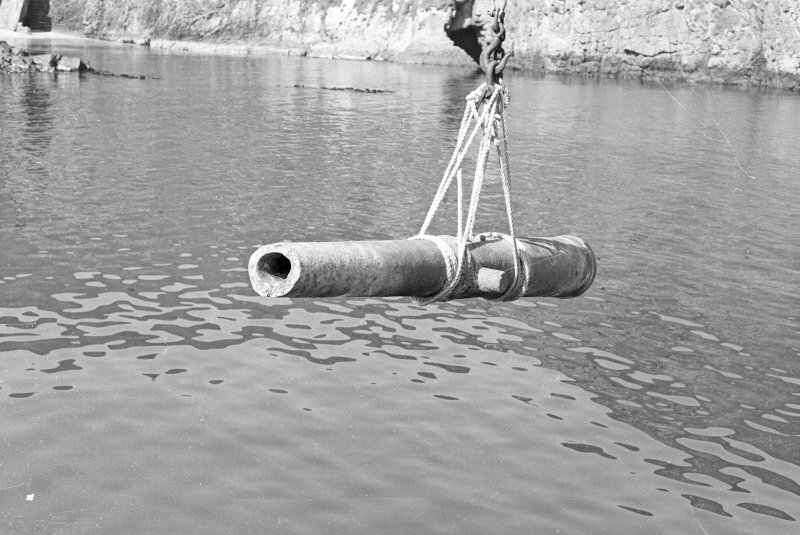 The bronze media sacre is hoisted ashore at North Haven (1970). 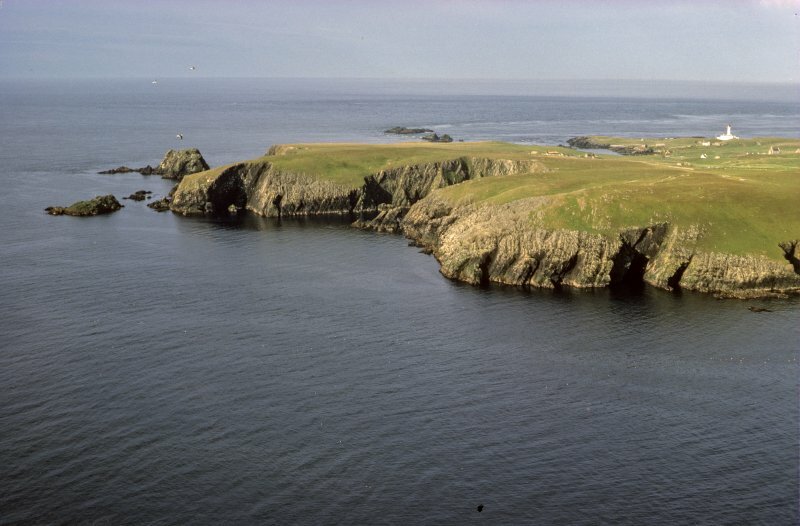 The present-day crofts on Fair Isle, seen from the south-west end of the island. The clusters of croft buildings approximate to the 'seventeen households living in huts' descried by one of the Grifón survivors in 1588 (1977). 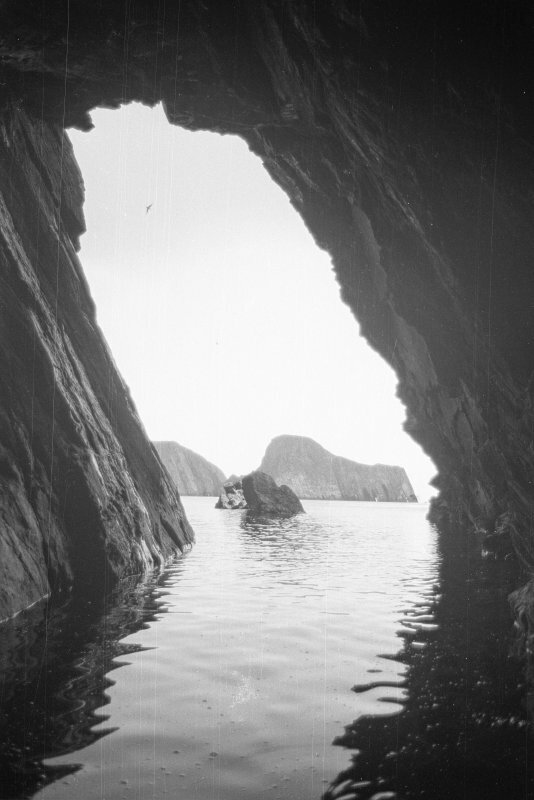 View from inside the cave at the head of Stroms Hellier, looking past the central reef towards Sheep Rock (1977). Near-vertical aerial view of Stroms Hellier. Note the extremely confused waters in this area (1977). Small lead scatter-shot of various diameters, ranging from 2 to 4mm. 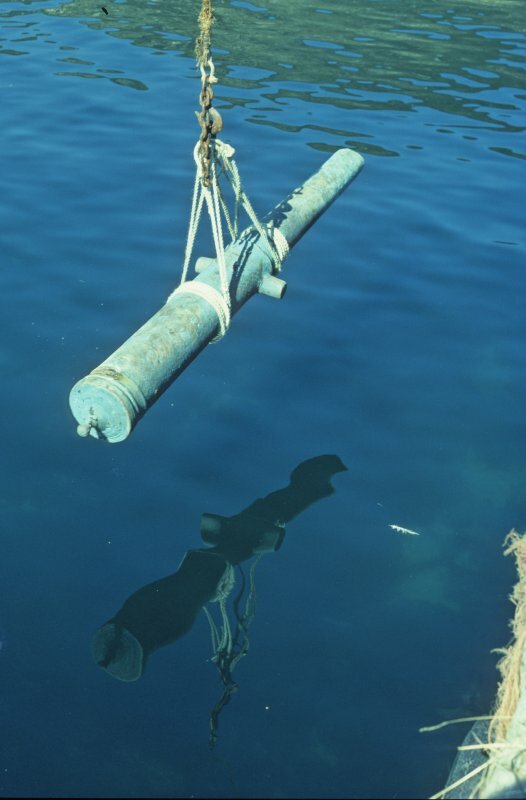 There is no indication in documents or parallel finds from other Armada wrecks that this type of shot was used by the Spaniards in 1588, and these may well derive from later fowling activities. Lead seal, probably from a bale; the design on this face indecipherable. Scale in millimetres. 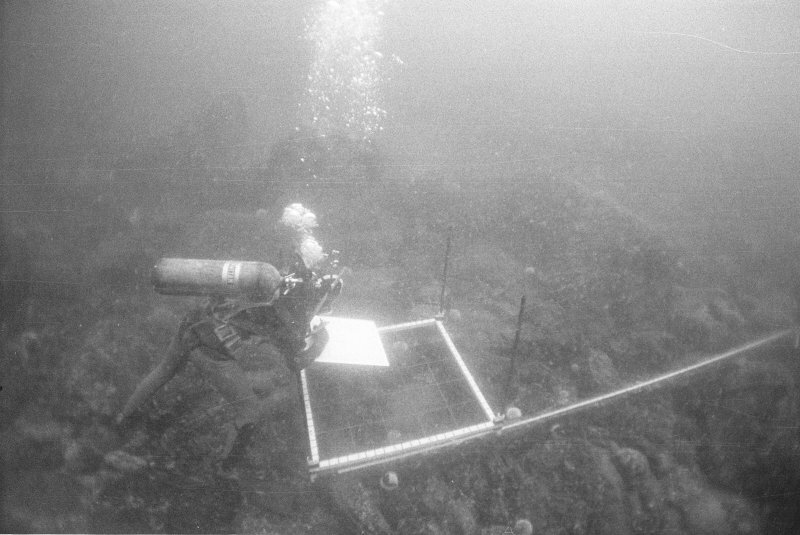 Keith Muckelroy surveying the sea-bed in the vicinity of the large anchor, almost certainly belonging to El Gran Grifón and found some 60m to seaward of the main site in a depth of 23m (1977). Tony Long recording the media culebrina using a drawing-frame (1977). 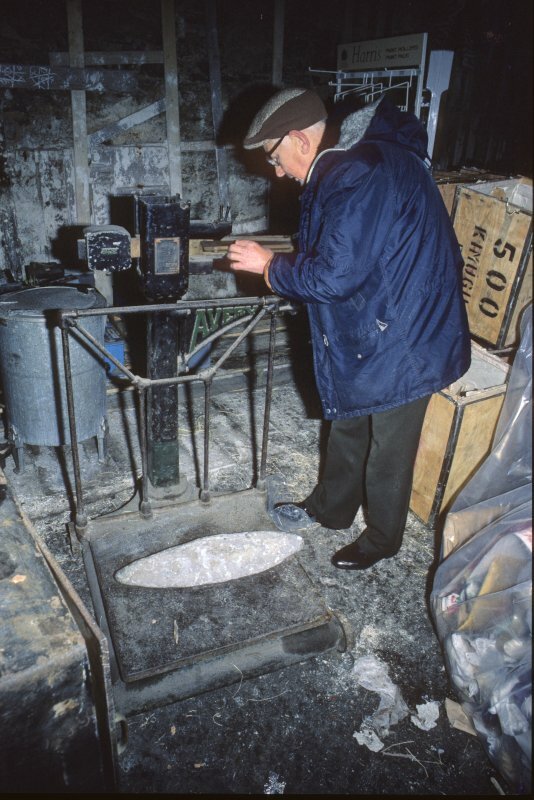 Andrew Williamson, curator of the Shetland Museum, weighing one of the lead ingots (1986). 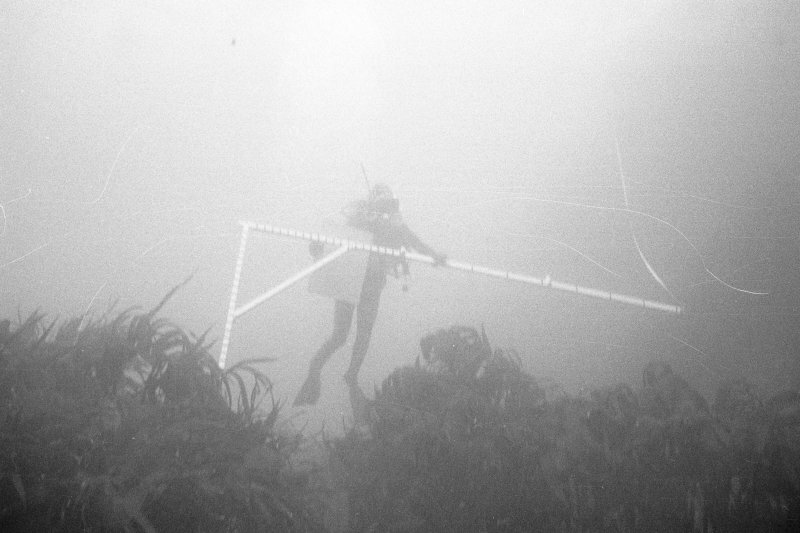 Two sounding-leads from the wreck (1970). Scale in inches and centimetres. 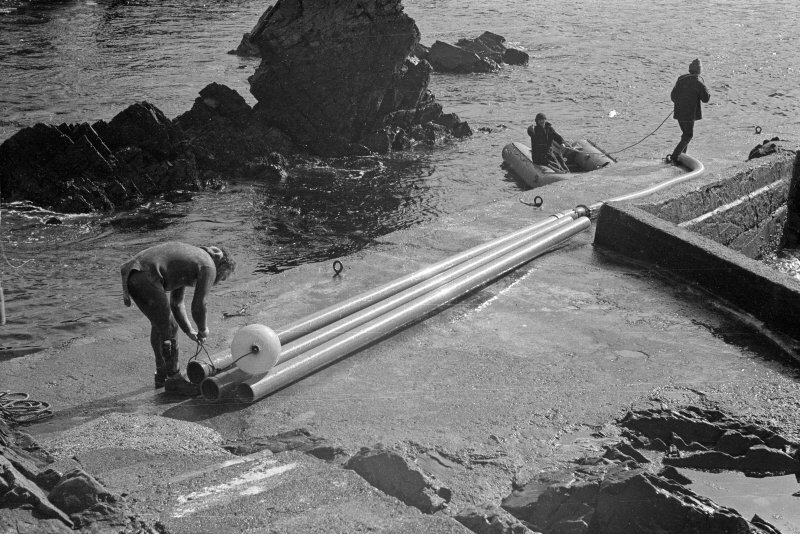 Andrew Fielding prepares a load of larger stones too big for the airlift for raising inside a net bag (1977). Note the bronze media culebrina in the left foreground. 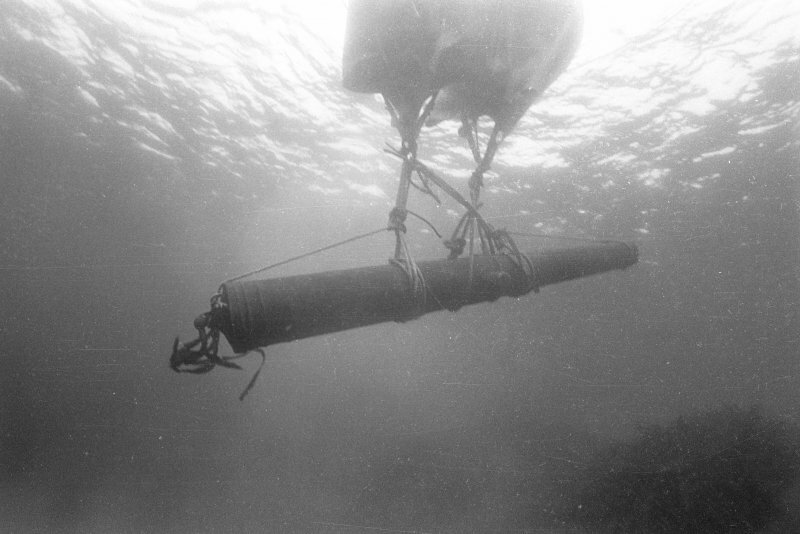 Raising a wrought-iron esmeril to the surface with an airbag (1970). Stroms Hellier showing the above-surface part of the rock ridge running along its middle, which tradition asserts was the fossilised wrecked ship. While this is patently untrue, the location is accurate; all the wreckage discovered lies along its edge (1977). Silver 4-real coin of Philip II minted at Toledo (obverse). The breech end of a cast-iron gun recovered from a mobile shingle context, which has eroded the piece to reveal its bore in section (1974). Inside view, before cleaning. Scale in inches. 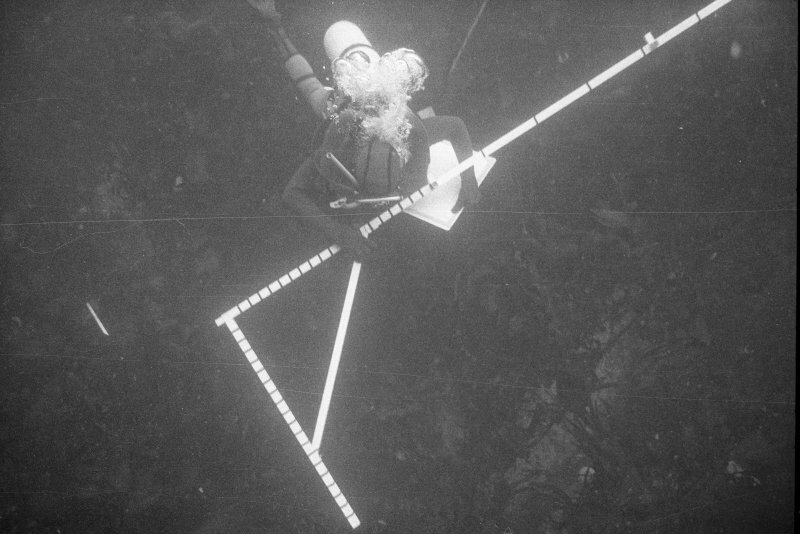 Keith Muckelroy measuring the large anchor, almost certainly belonging to El Gran Grifón, found some 60m to seaward of the main site in a depth of 23m (1977). 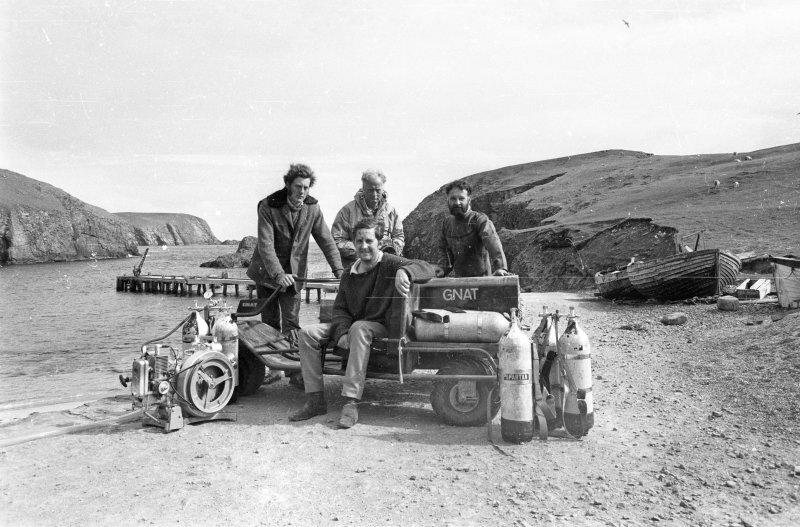 Andrew Fielding at the excavation face with the airlift (1977). Cast-iron guns. (1) 80-mm bore, recorded in situ; (2) 95-mm bore, recorded in situ; and (3) 90-mm bore, sectioned by abrasion, raised, see other images for more detail. 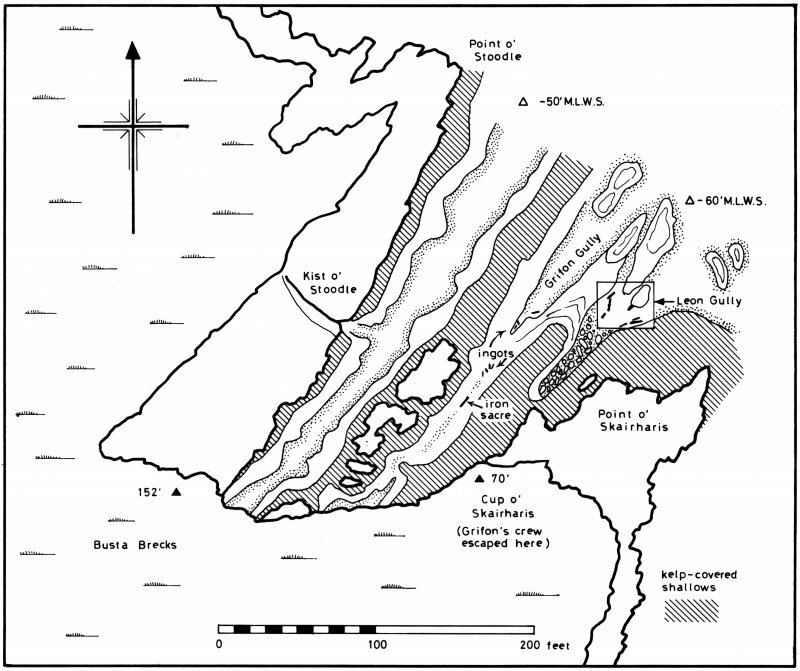 General plan of the wreck-site, 1970. 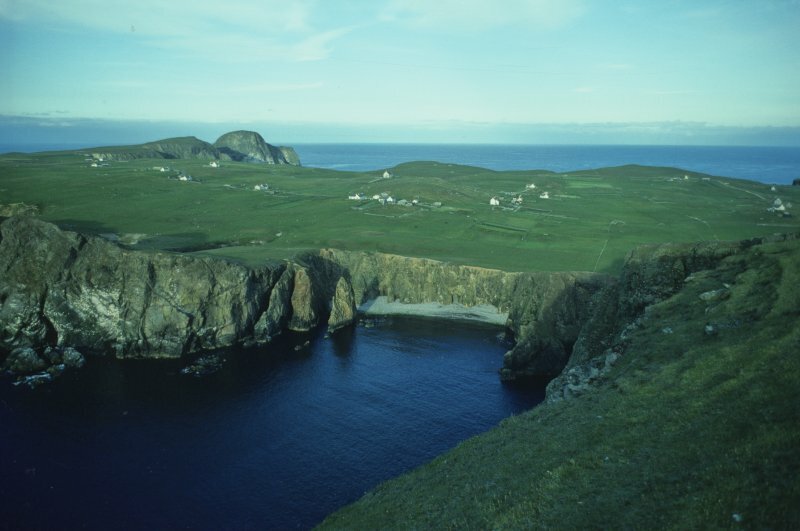 The SE end of Fair Isle, seen from the top of Sheep Rock. 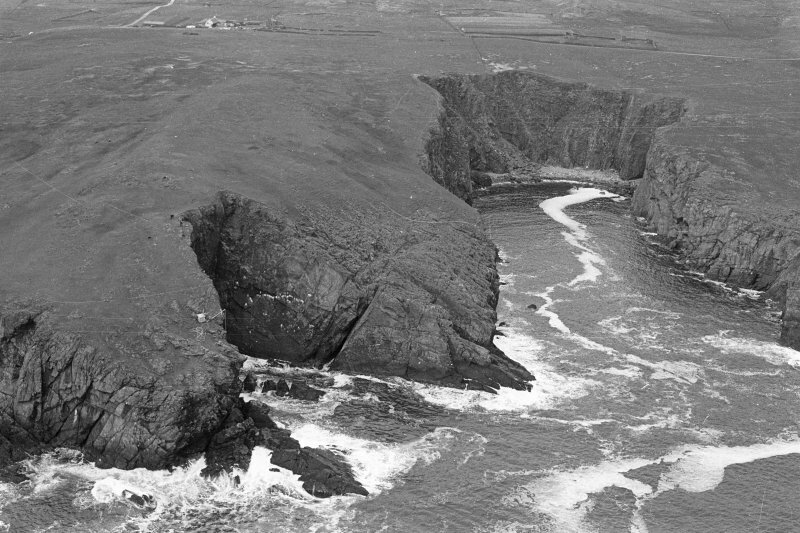 The overhanging cliff of Stroms Hellier, where the Gran Grifón was wrecked, is seen in shadow on the left with Swartz Geo to its right. 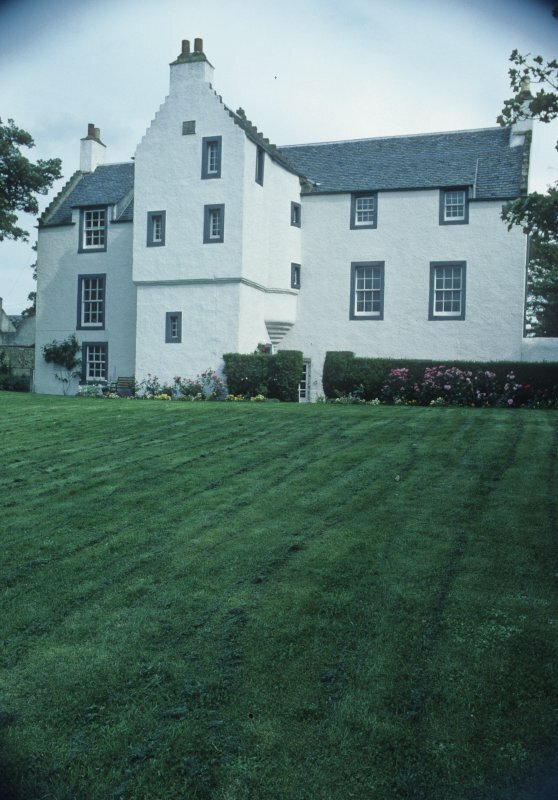 The old manse in Anstruther Easter, built by the minister, James Melville, in 1590. Melville received the Spanish survivors when they landed at Anstruther on 6 December 1588 and recorded the event in detail in his celebrated Diary. An area of concretion at the bottom of the main gulley, prepared for treatment with explosives (1977). Wrought-iron breech-block. 1977, scale in inches. 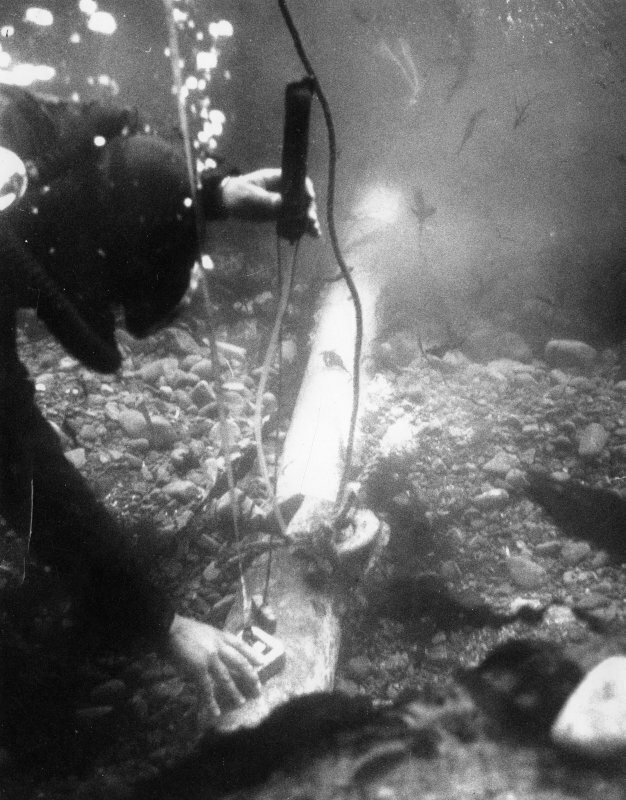 Tony Long using an inverted air-filled hose to determine relative levels on the wreck-site (1977). Section through the broken end of the bronze media culebrina showing its off-centre bore (1970). Scale in inches. The airlift in action (1977). 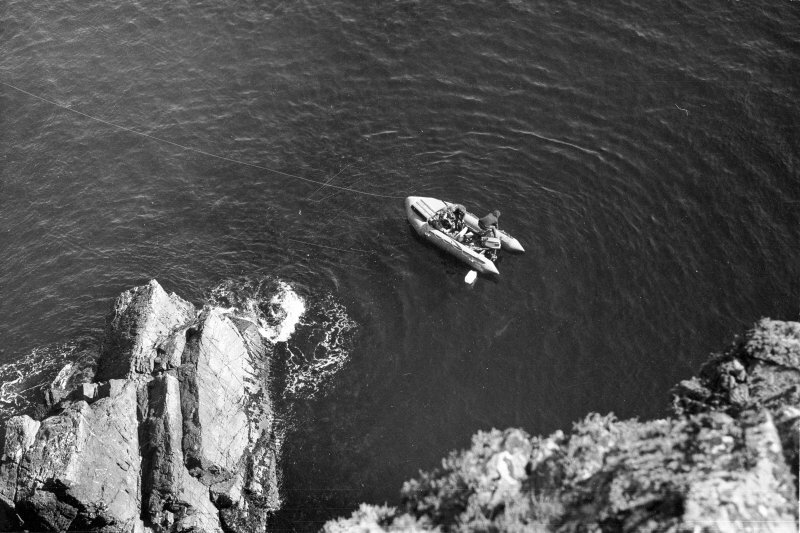 One diver is down operating it while his buddy acts as standby in the boat. 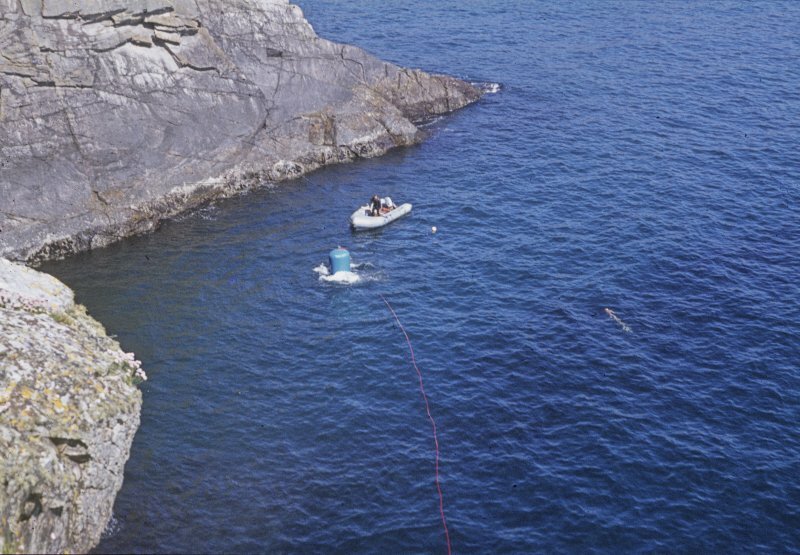 An orange buoy is attached to the diver below. 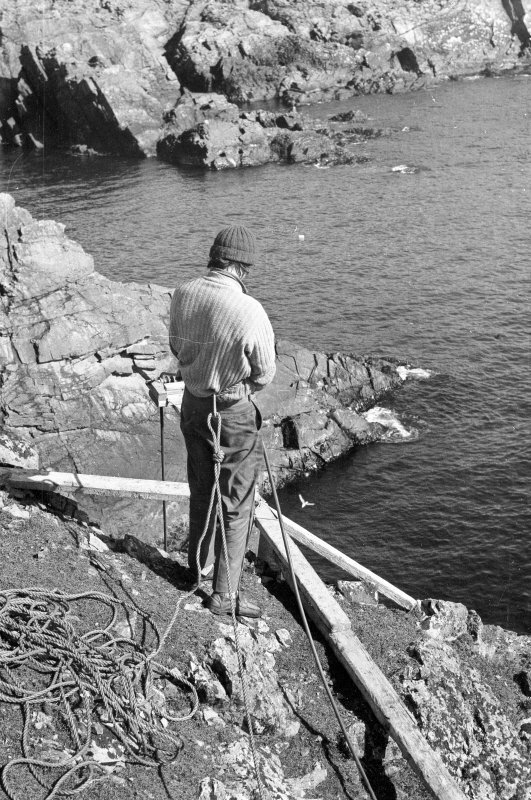 Tom Henderson of the Shetland Museum conserving the wrought-iron esmeril (1970). Fair Isle [name centred HZ 21 72]. Formerly entered as HZ27SW 186. 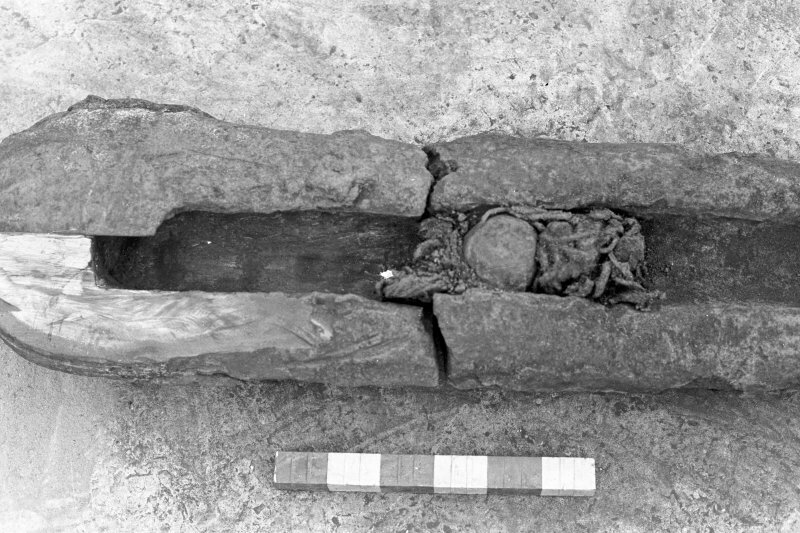 For traditionally-associated burials ('the Spainnarts' Graves'), see HZ27SW 249. EL GRAN GRIFON. The ship of the Duke of Medina Sidonia [incorrect: Juan Gomez de Medina], Admiral of the Spanish Armada, is said to have been wrecked in Swarty Geo in 1588. The wreck of the Spanish ship 'El Gran Grifon' has been found in 30 to 60 feet of water in the bay, Stroms Heelor, not Swartz Geo as was traditionally believed. Information from C Martin, 29 June 1970. This discovery is significant as representing an example of a 'second-line' Armada ship of essentially non-combatant type. 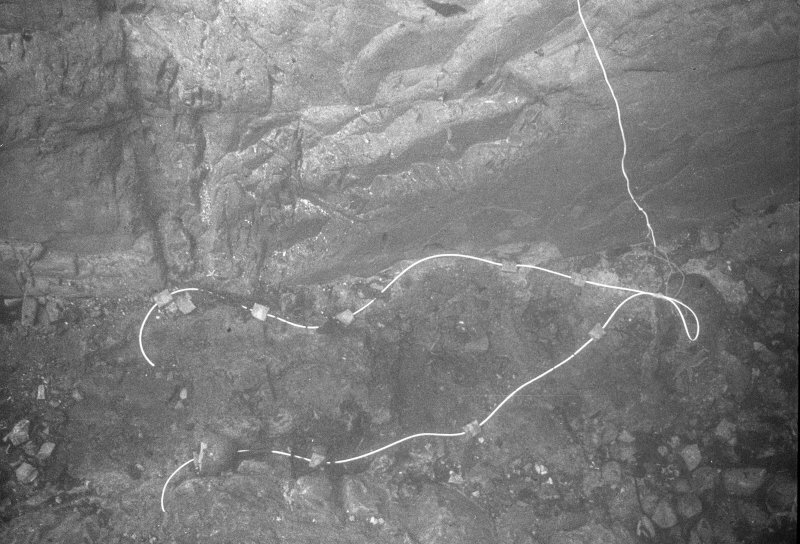 No remains of hull structure have been recognised and little archaeological cohesion is apparent as the total break-up of the ship has resulted in the subsequent quasi-0random deposition of artifacts within the deep gullies that run parallel to the NW side of the inlet. It may be supposed, however, that the larger and heavier objects have moved less far, and that their positions at least reflect the layout of the ship. 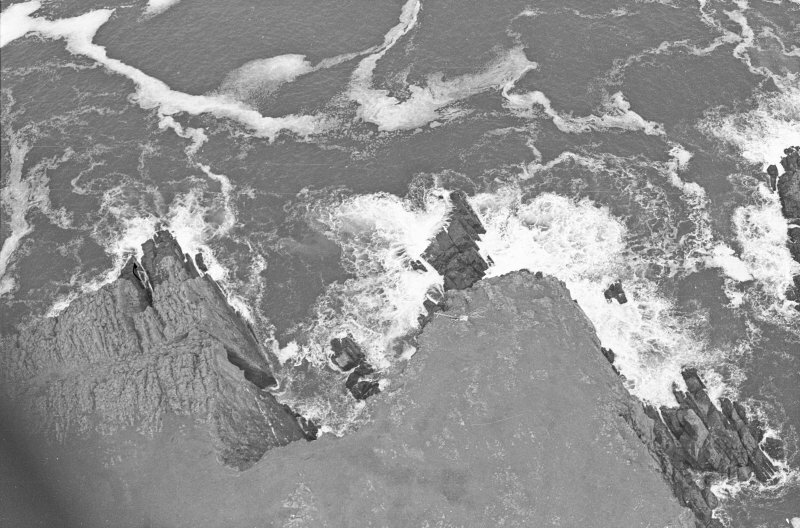 On this basis, the seaward deposits (within 'Leon Gully') at the base of the overhanging cliff that drops from the headland at Point o'Skairharis probably represent spill from the upperworks at the stern of the ship. A rudder pintle was found here and four of the iron guns found in this gully appear to be paired; these may have been stern chasers. 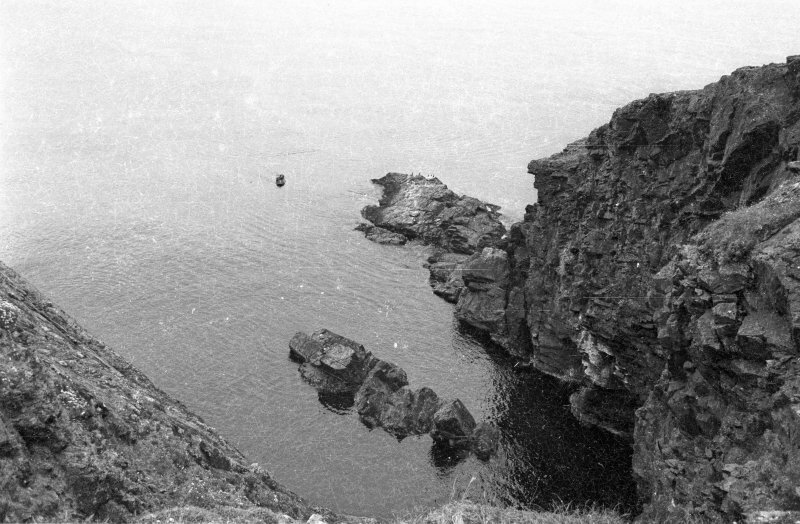 The most landward evidence of wreckage so far noted lies within the western cleft of the second gully ('Grifon Gully'), where an abraded iron gun (possibly a bow chaser) was discovered. The lead ingots found within this area would thuds have lain within the fore part of the ship, consistent with recognised Armada practice. The remains are thus spread out over a distance of some 130ft (39m), suggesting a length of about 100ft (30m) for the hull. The midships section, which would have contained most of the ship's contents, would thus have lain in and around the wide and shingle-filled seaward end of Grifon Gully. Ground swell (particularly in storms) would have taken small or light objects from the forward part of the wreck into the shingle of this gully, leaving only such massive objects as the iron gun and iron ingots that were found lying in the narrow cleft. Any bronze guns in the cleft would have been easily found and removed in the 18th century salvage operations. Preliminary excavation at the head of the wide part of 'Grifon Gully' has shown that the gully bottom is filled with concreted wreckage; this is covered by several feet of concreted wreckage and awaits investigation. 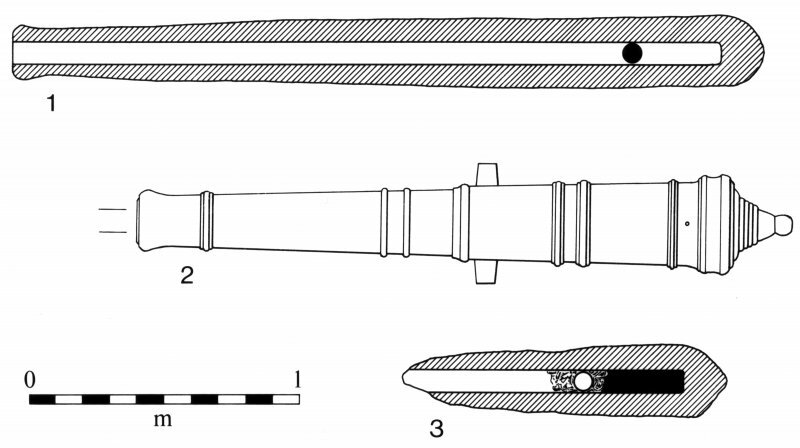 1. broken-off muzzle end (0.65m long) of a bronze gun (probably a media-culebrina of about 3m length) of bore 0.11m. The wooden tampion was found in place and the piece was of seriously deficient manufacture, displaying both 'honeycombing' and boring asymmetry. 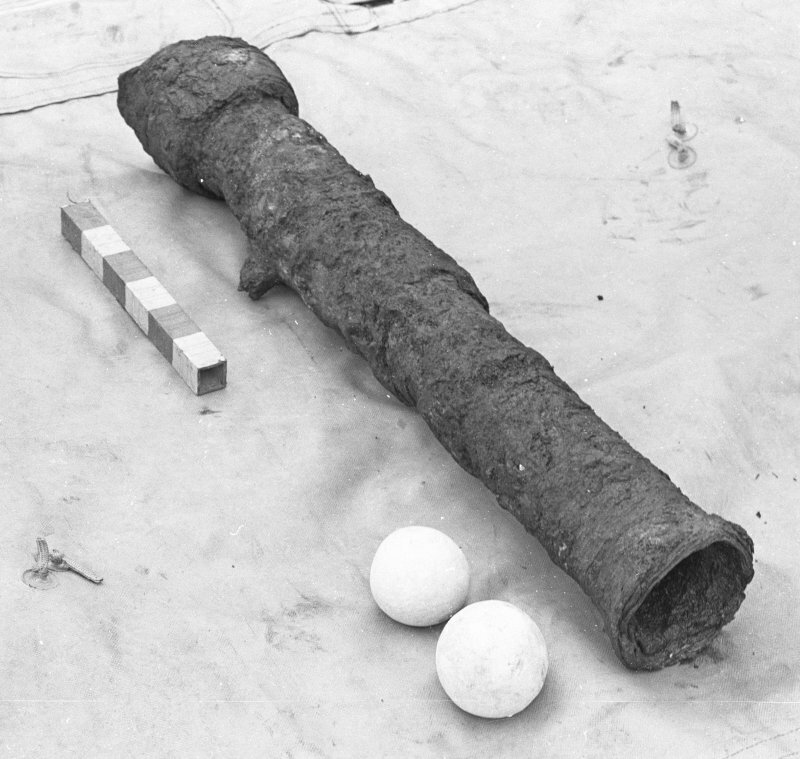 2. cast-iron gun (probably a small sacre) of about 2.85m length and 80mm bore, with a 76mm ball lodged in the bore. This piece was eroded longitudinally almost beyond the bore, and would originally have weighed about 675kg. 3. complete bronze media-sacre with intact trunnions and dolphins, without decoration or inscription, but found loaded with charge, ball and wadding. The length, bore and weight of this piece were 2.4m, 72mm and about 448 kg respectively. 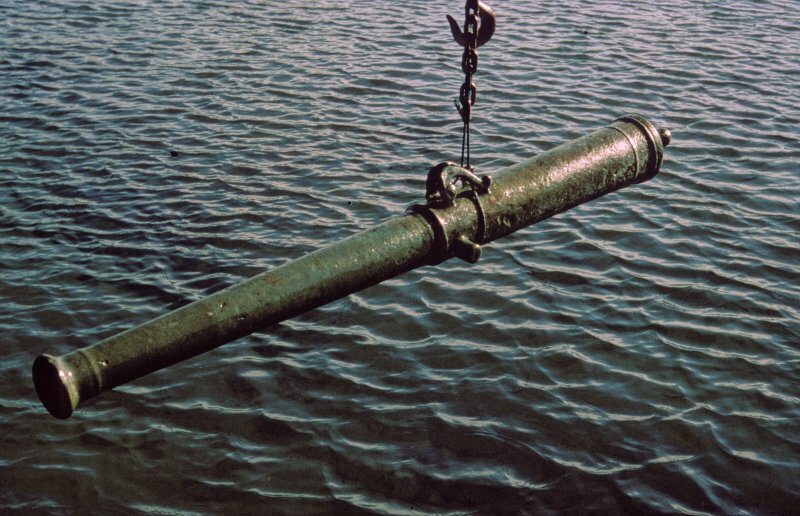 4. cast-iron gun of 2.4m length and about 100mm bore (the length:bore ratio being thus 22:1). 5. the badly-eroded and partly crushed remains of gun of similar type and calibre to (4) were found beneath a large rock. 6-7. cast-iron guns of length 1.2m, bore no more than 50mm and nondescript type. 8. wrought-iron breech-loading gun of 'made-up' construction (using hammer-welded strips and hoops), measuring 1.65m in length and about 76mm in bore. 9. as (9), but measuring 1.8m in length and about 90mm in bore. 10. wrought-iron breech block for a gun of the same type as (8) and (9) but smaller than either (probably representing examples of the esmerile or Esmeril type). 11. handled wrought-iron breech block (0.3m long and with a chamber bore of about 50mm); this probably formed part of a swivel gun. 12. three wrought-iron breech blocks (each 0.35m long and with a chamber bore of 40mm) represent smaller and longer pieces than (11). Six of these pieces (nos. 1, 3, 8, 10, 11 and 12) were raised; the others were left in situ. Of the 92 pieces of cast-iron shot recovered, 72 were sufficiently well-preserved to allow accurate measurement of their diameters; these display mould-lines and, in one case, a foundry-mark [illustrated: fig. 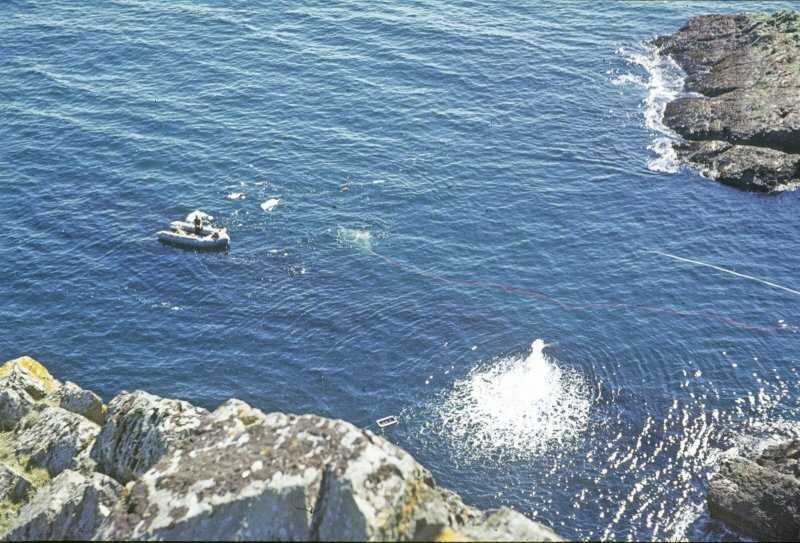 6] which has parallels on shot from the wreck of the Santa Maria de la Rosa in Blasket Sound, Ireland. The other 20 were apparently similar, and this sample is probably to be considered representative. Of the 72, 16 were of diameter 95-105mm (appropriate to a Media-culebrina or Cuarto de canon), 35 of diameter 70-89mm (appropriate to a Sacre, Media-Sacre or Esmeril largo), 17 of diameter 51-66mm (appropriate to an Esmeril) and 4 (with two pieces of lead shot) of diameter 32-51mm (appropriate to a Pieza). Five socketed lead hemispheres (of between 57 and 76mm diameter) represent 'bar' or 'trundle' shot, which was probably intended to be fired from esmeriles and esmeriles largos. A considerable quantity of lead small arms ammunition was recovered: 427 musket balls (20mm diameter), 1683 arquebus balls (13mm diameter) and three pieces of scatter shot (30mm diameter). The first two may also have been fired from the esmeriles as 'cased'ammunition. 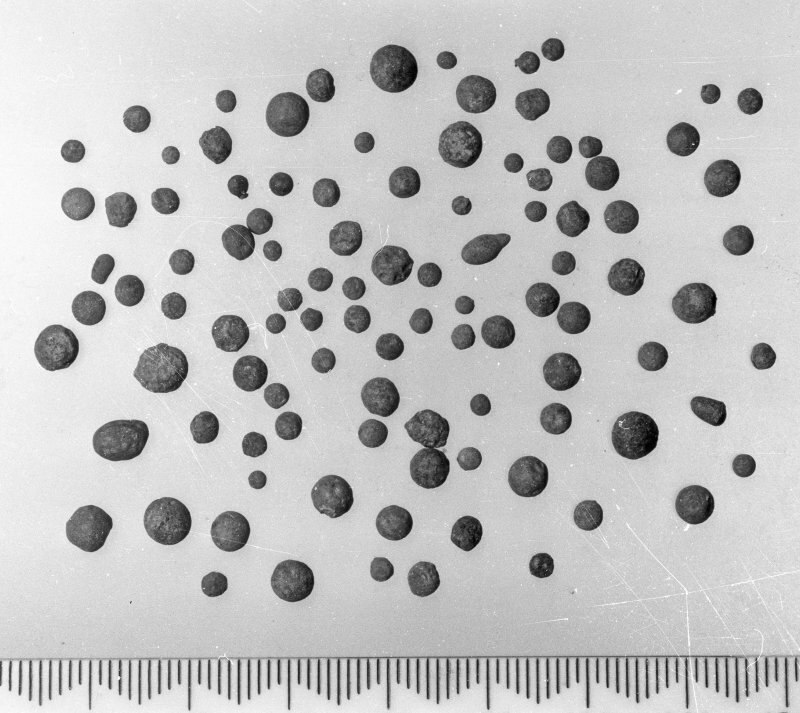 A few of the lead bullets display evidence of high-energy impact, and were presumably fired by the English. All the evidence is consistent with the pattern presented by the twelve guns so far identified, which probably formed one-third of those carried. The 38 guns carried were probably formed as follows: 4 media-culebrinas, 4 sacres, 3 media-sacres, 6 cuartones de canon, 6 piezas de hierro collado, 9 esmeriles largos and 6 esmeriles. This picture is consistent with that suggested (from documentary evidence) by Lewis and also with a wholly defensive role. 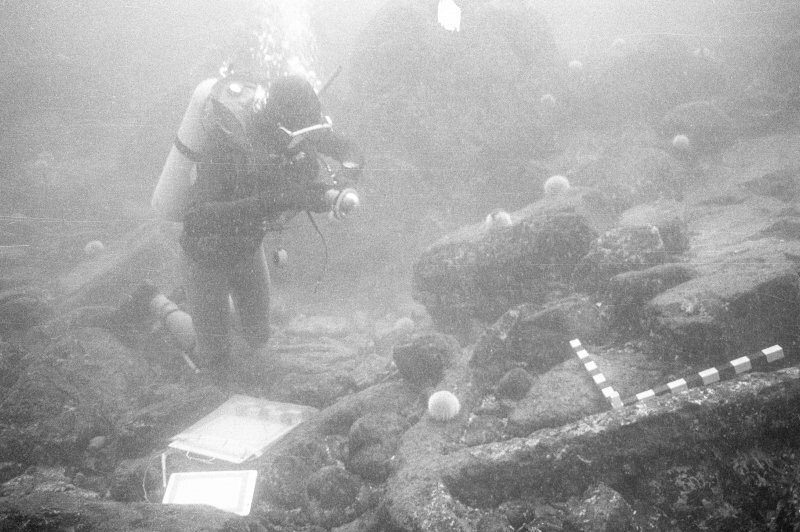 The carriage of lead ingots is well-documented as commonplace on Armada wrecks, but they are otherwise rarely found. The six ingots recovered from this wreck [illustrated: fig. 7] divide between quintals and larger planchas; the former were man-portable and probably intended to be issued to the army. Perhaps surprisingly, no pottery has been found on the wreck. Ship's fittings found comprise: a fine bronze sheave or pulley-wheel, a wrought-iron rudder-pintle, a drilled brass bush from a wooden sheave, and several hull bolts with associated oakum caulking. Sheets of sheet-lead scuppering, patching and sheathing ('plomo en hojas') were found widely, as were scraps of sheet copper and copper rivets. 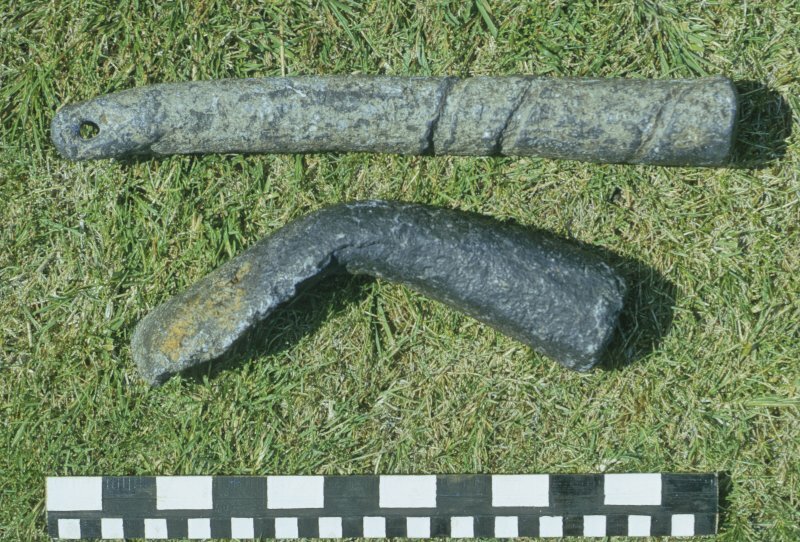 Other finds include a curved iron blade (possibly a shearhook), fragments of a large brass cauldron with lug handles, a hinged pewter flagon-handle and a copper loop handle. 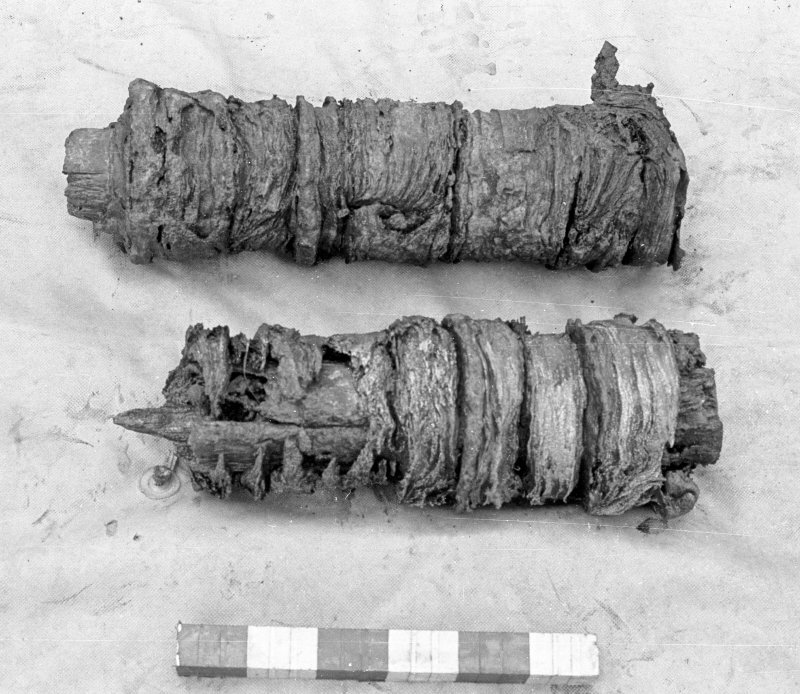 The breech portion of an arquebus barrel of damascene-type construction, a brass button, a silver coin and a lead seal were also found. (For general plan of wreck site and plan of 'Leon Gully', see figs. 2 and 3 respectively: selected artifacts are also illustrated. For provisional comparative armament table of the ship, see Martin 1973, 454-5, tab. 1). C J M Martin 1972; C J M Martin 1973. El Gran Grifon of Rostock was the flagship of Juan Gomez de Medina, Captain-General (Capitana) of the squadron of urcas (supply-ships), and one of several Hanseatic trading vessels taken into the Armada fleet. Such hulks were typically sturdily-built craft designed for capacity rather than speed, but with the disadvantage that they could not sail close to the wind. The 23 vessels of this type had an aggregate tonnage of over 10,000, making this squadron the largest in the fleet. They were, however, not fighting vessels, and carried only a light armament of essentially defensive character. The ship was present at the initial muster (held in Lisbon on 7 May 1588) and sailed with the fleet at the end of May. The supply squadron was separated from the rest of the fleet by storm and cruised independently off the Scillies before rejoining. This vessel was the only hulk to engage in fighting during the run up-channel, and suffered significant damage at the hands of the Revenge. She played an active part in the rearguard action off Gravelines and kept up with the rest of the fleet during the run to the N. With three other heavy ships, she became detached off Northern Scotland on 20 August. Of the other three vessels, the Barca de Amburg foundered on 1 September (her crew being transferred to the Grifon); contact was later lost with the other two off NW Ireland. The ship ran near-aimlessly around the NE Atlantic, apparently sighting St Kilda, the Outer Hebrides and Orkney and suffering considerable leakage before anchoring in one of the few sheltered anchorages off Fair Isle. The subsequent events are unclear, but the ship sank in the small cave-ended geo of Stroms Hellier, probably on 28 September and possibly while attempting to run aground within the protection of Swartz Geo [name: HZ 210 702]. Local legends recall the sinking, the escape of the crew and the mass grave (Spainnart's Grave: NMRS HZ27SW 249), which was later lost to the sea. The surviving crew members were subsequently repatriated from Scotland. A contract of 1593 records the conception of a projected salvage operation (by William Irvine of Sebay), which was intended to recover the guns but was probably never put into effect. A more serious attempt was made by Captain Jacob Row (or Rowe) of London and William Evans of Deptford in 1728, with the use of an early 'diving engine' and under the misapprehension that the Gran Grifon was a 'treasure ship'. 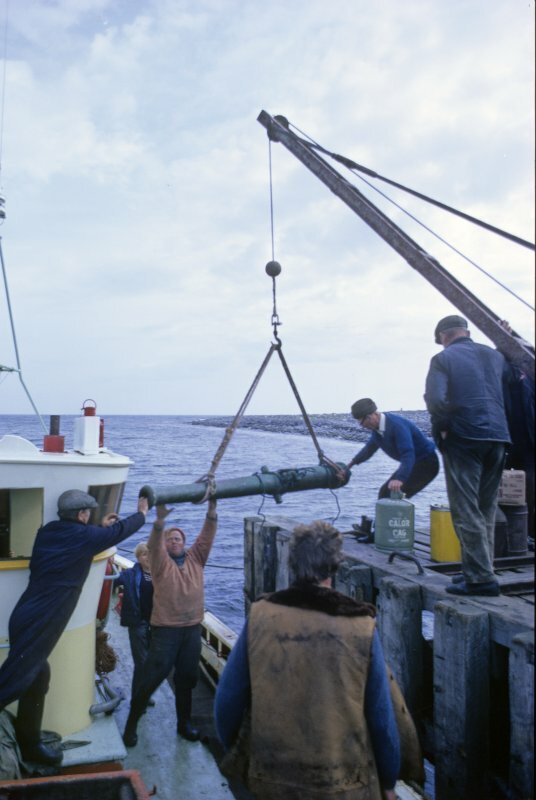 Two or three 'brass cannons' (now lost) were recovered before Row turned his attention to the recent wreck of the VOC ship Adelaar (BF60NE 8002) off Barra. 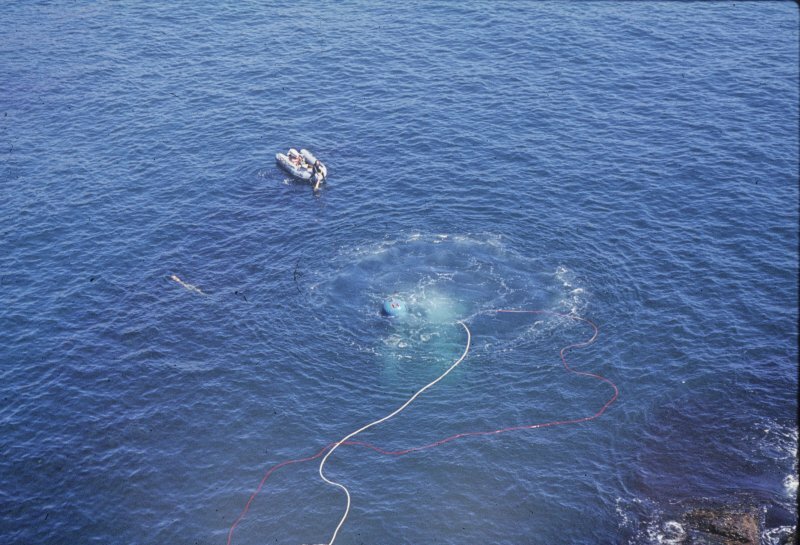 The dispersed remains of this wreck were discovered on 9 June 1970 by C Martin at a depth of about 15m just outside the mouth of the geo. Both bronze and iron guns were identified, as well as iron cannonballs and lead ingots (both rectangular and boat-shaped). 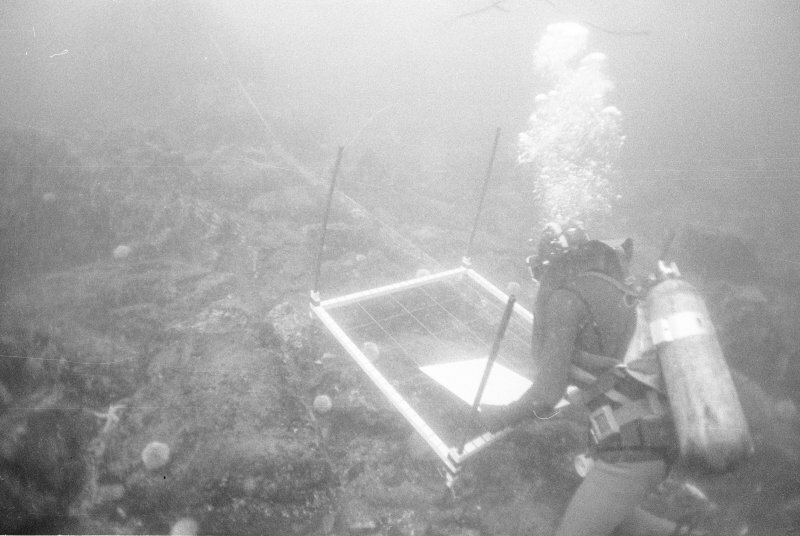 A pre-disturbance survey was completed (by C Martin and A Bax) and an airlift constructed before excavation began. This operation revealed numerous pieces of ordnance, which served to demonstrate the low quality of manufacture prevalent among Armada guns. There were recovered two bronze guns, five cast iron guns, two wrought iron guns, and the breech blocks of a further two pieces. Almost a hundred pieces of iron roundshot were recovered, 72 of them in sufficiently good condition to allow the accurate determination of their diameters. These were found to form four groups, corresponding without exception to the types of gun previously postulated. 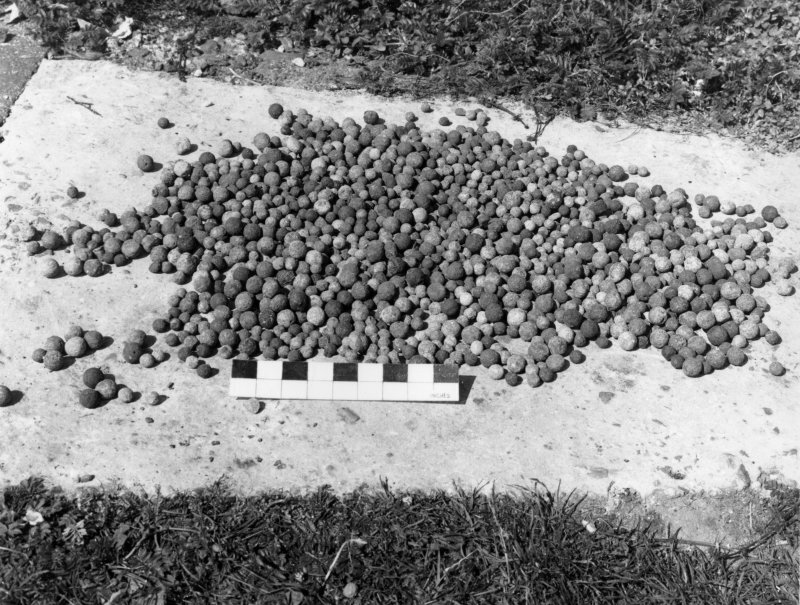 Two 1.5-inch lead balls and five socketed lead hemispheres of various sizes were also found, and were identified as 'trundle shot' for use against rigging. 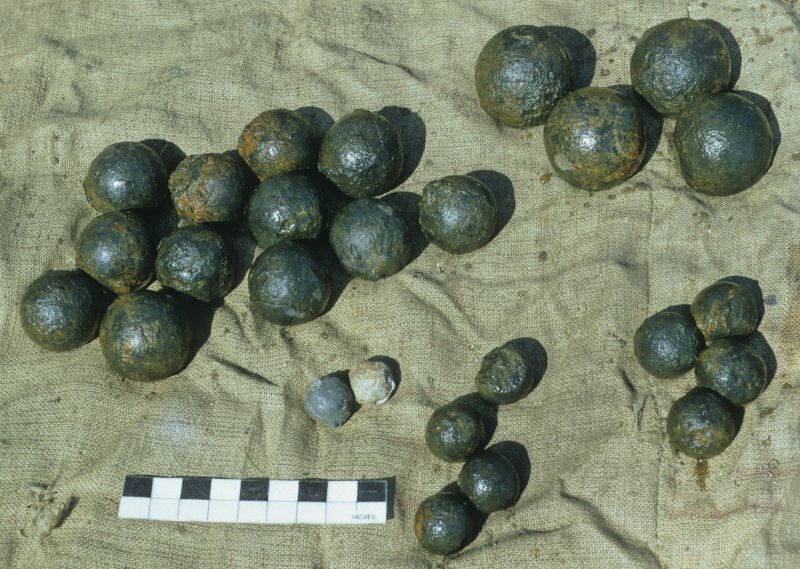 Over 4000 musket or arquebus balls were found, as well as many scraps of lead sheathing. Small finds were varied but not numerous. They included a lead seal bearing the arms of Philip II, a four-real coin of the same monarch, a bronze sheave or pulley-wheel, fragments of a bronze copper ('calderon de cobre'), the pewter handle of a 'Hanseatic' flagon, and other pieces of military equipment. 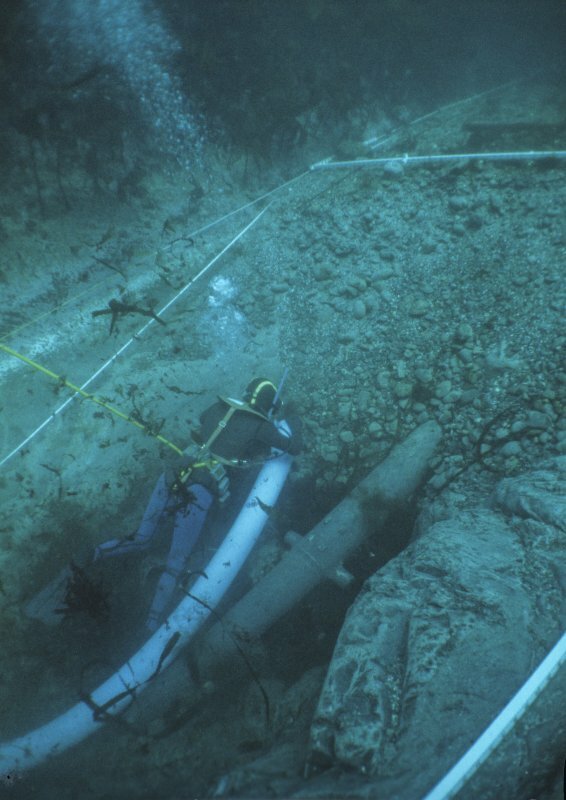 In the latter part of the season, assistance was received from A Baldwin and divers of the Naval Air Command Sub-Aqua Club; their use of lifting bags allowed the removal of numerous heavy boulders. Further finds during this phase included tiny copper rivets, a minute scrap of gold, a small bronze mounting, and further incomplete pieces of ordnance. 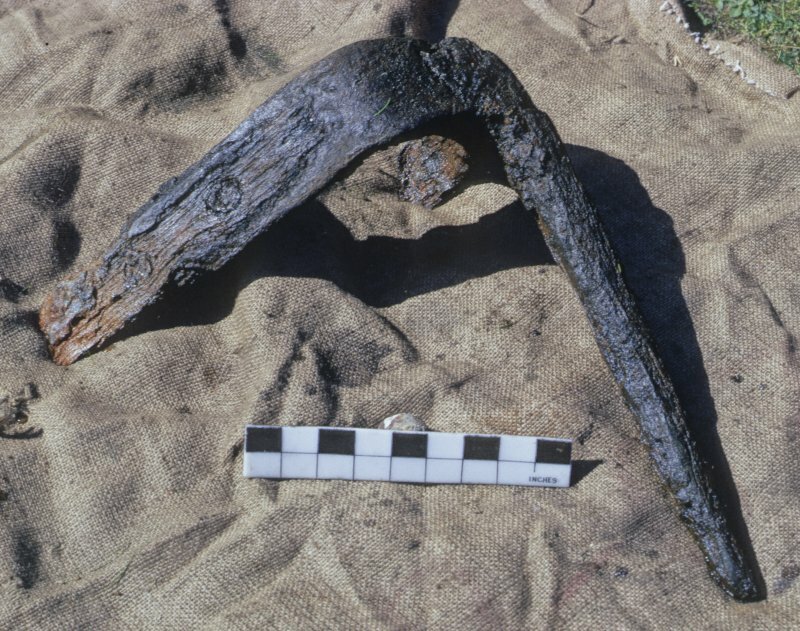 A curved steel blade (probably a shear hook) and one of the wrought iron rudder pintles were also found. 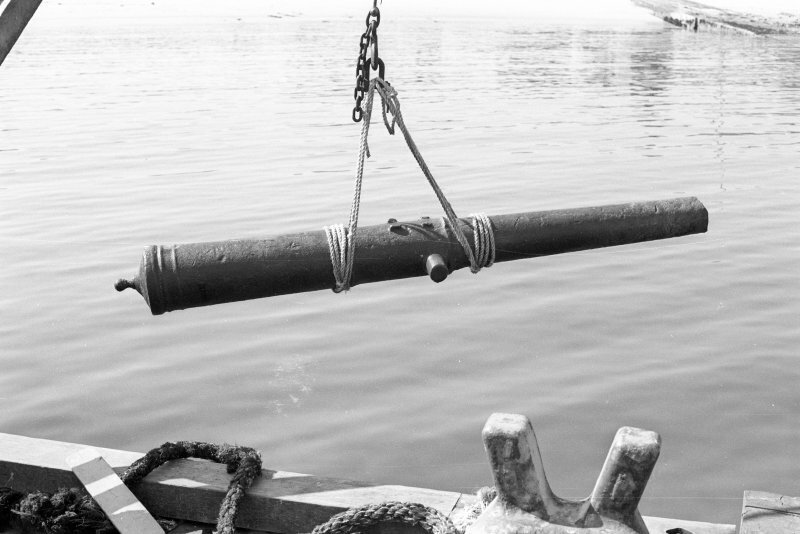 This latter discovery supports the local tradition that the ship ran bows first into the geo. Further excavation, at the end of the season, revealed the concreted remains of considerable numbers of badly decomposed iron objects within the head of the geo; these were left unexcavated. [No structural remains were apparently noted and the finds are held in the County Museum Lerwick; some of the guns were left in situ. No accurate location is cited but a plan of 'Leon Gully' and tables of recovered iron shot and of estimated armament are published within the text]. Assigned to class 4 ('dispersed and unstable'). Stroms Hellier Geo, Fair Isle, Shetland: El Gran Grifon. 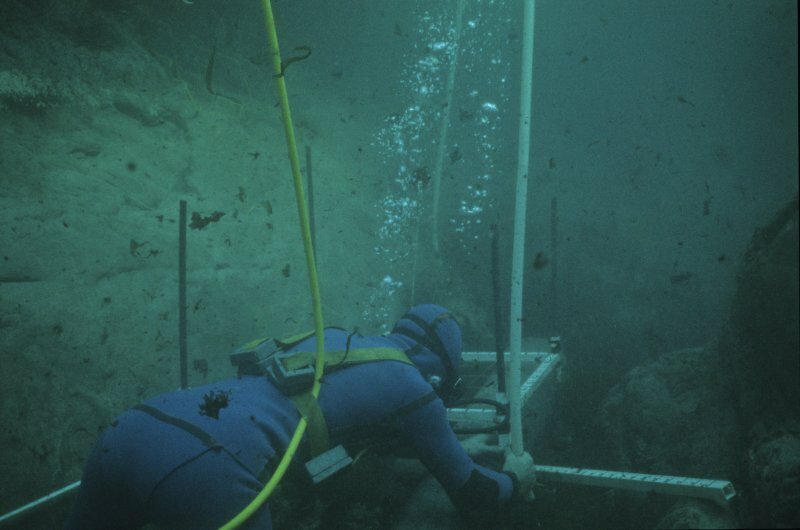 Excavation of this Spanish Armada wreck, begun in 1970, was completed by a team from the Institutre of Maritime Archaeology, University of St Andrews, under the direction of C Martin. The main gully was cleared to reveal a deposit of ordnance and munitions: the lack of finds of any other description suggests that all portables were removed before the ship sank. The finds included a bronze demi-culverin 3.66m long, the broken-off muzzle of which has been found in 1970, two wrought iron breech-loading pieces and several breech blocks, and two well preserved cxast-iron guns which were recorded in situ but not raised. Two badly abraded cast-iron guns were raised for analysis: one of them, when sectioned, proved to be loaded. 293 pieces of iron shot, of various calibres, were also recovered, together with a large number of lead balls of musket and arquebus size. Finds have been deposited with the Shetland County Museum, Lerwick. EL GRAN GRIFON, Spanish Armada galleon. Wrecked at Stroms Heelor, Fair Isle in 1588. Archive Ref: Hudson Kenneth & Nicholls Archives D 17/388/32 & D 8/1/3; Martin 1972; WFI p. 5; Treasure divers guide 1973 p. 319/320; Henderson 1985 p192; OLM Vol 1 p. 78/p. 95. (No classification or cargo specified: date of loss cited as 1588). El Gran Griffon: this vessel was wrecked at Stroms Hellier, Fair Isle. Registration: Spanish. (Location of loss cited as N59 31.0 W1 37.5). 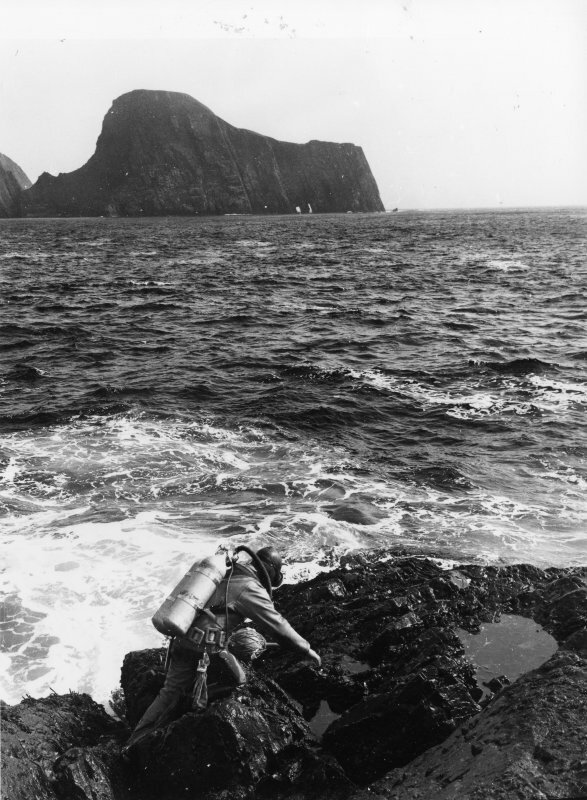 El Gran Grifon, Stroms Hellier, Fair Isle. This 650-ton merchant ship was built at Rostock in the Baltic and served as the flagship of the 23-strong Supply Squadron. As such, she carried a general stores cargo and 286 men, 43 of them from her original German crew under her owner and master Burgay Querquerman and the remainder soldiers of Spanish or Italian origin. Of bluff and high construction, the ship was credited with an outfit of 46 guns, most of them light iron pieces but including eight heavier bronze weapons. After suffering severe damage (and fifty or more dead) during the running battles in the English Channel, the vessel was made safe in the middle of the fleet and formed part of the fleet rearguard after the fireship attack off Calais on 8 August. After keeping in contact with at least some of the other slower ships until off the NW coast of Ireland, she suffered severe damage from press of weather and ran before successive storms to (probably) St Kilda, Galway Bay and Orkney before anchoring in shelter off Fair Isle on 27 September. The vessel was driven aground the next day, being wrecked against the overhanging cliff of Stroms Hellier near the SE corner of the island. Only seven of the crew failed to escape but only easily-portable valuables were saved; most of the survivors were subsequently repatriated. 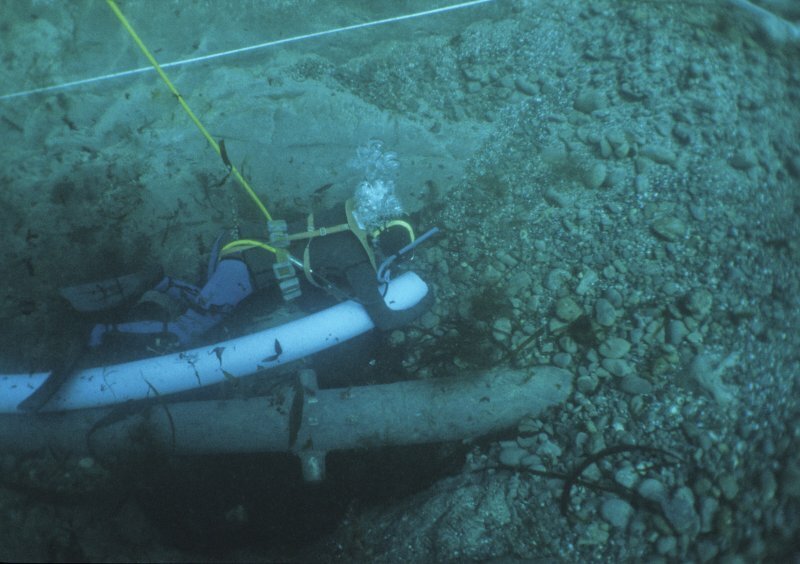 Within five years after the wreck, Earl Patrick of Orkney contracted William Irvine of Seabay to attempt salvage of the guns, but it is unknown what came of this venture. 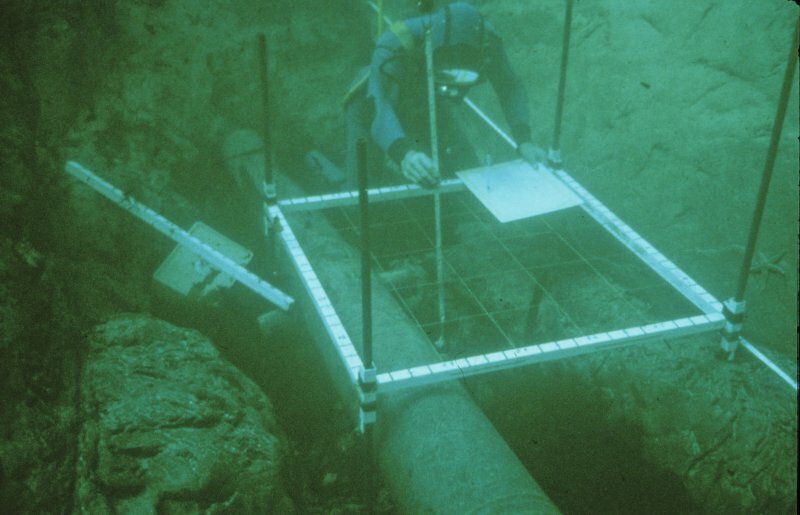 The wreck remained unexplored until 1728 when Captain Jacob Rowe of London and his partner William Evans brought their diving 'engine' (essentially a horizontal copper or brass 'barrel') to the island with the stated intention of raising the wreck, having evidently confused the ship with the 130-gun flagship San Martin. At least two guns were raised (for the loss of one man killed) before work was abandoned in favour of exploration of the more easily-worked Adelaar. After this, the wreck was given credence only by local folk memory and the occasional object washed ashore. 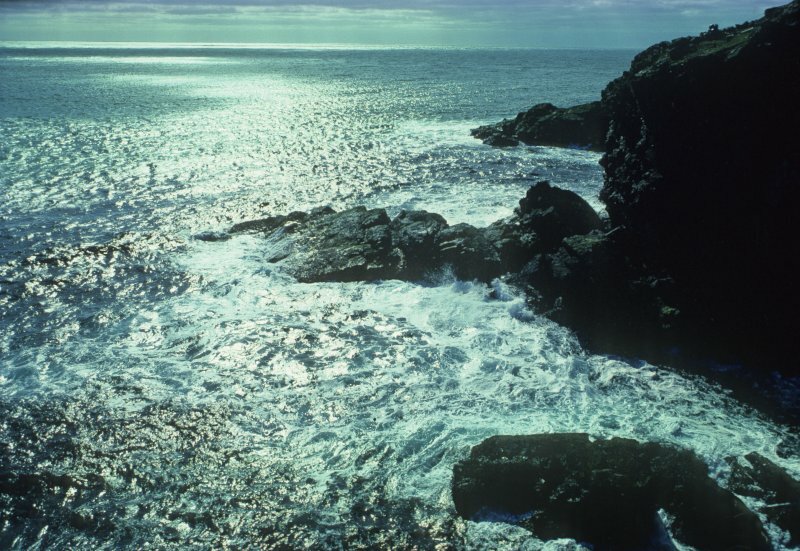 The deep wedge-shaped inlet of Stroms Hellier measures up to 15m in depth and is bisected along its length by a prominent reef. 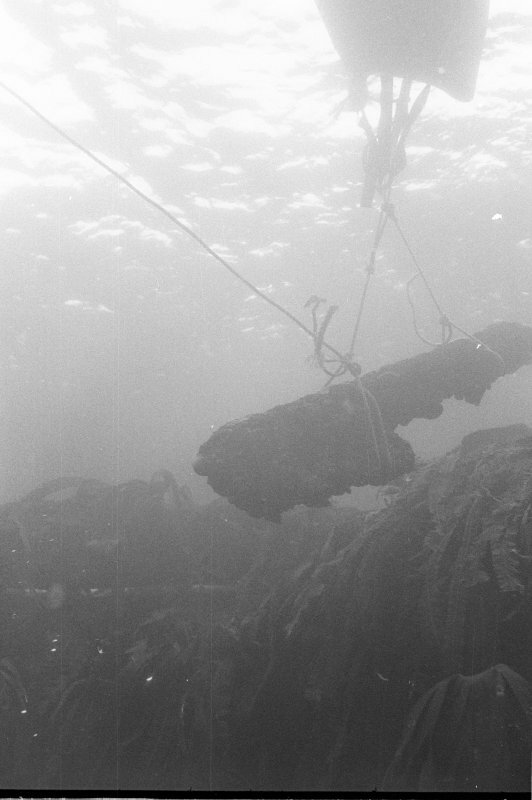 The remains of the wreck were discovered within it in 1970 during operations by C and S Martin, C Oldfield and S Wignall on the basis of local information. Finds comprised bronze and iron guns, lead ingots and musket balls, and an anchor, which had apparently been dropped in extremis. 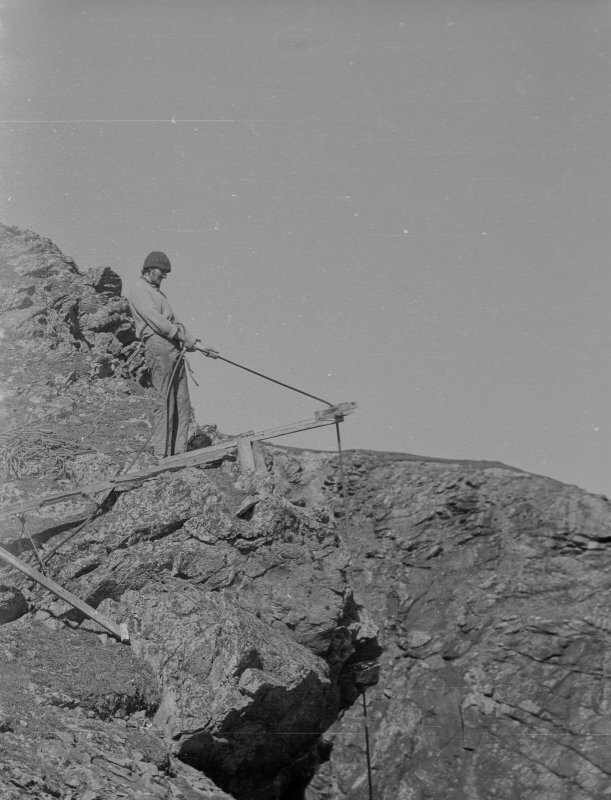 Survey work and limited excavation along the base of the cliff were carried out in the same year. 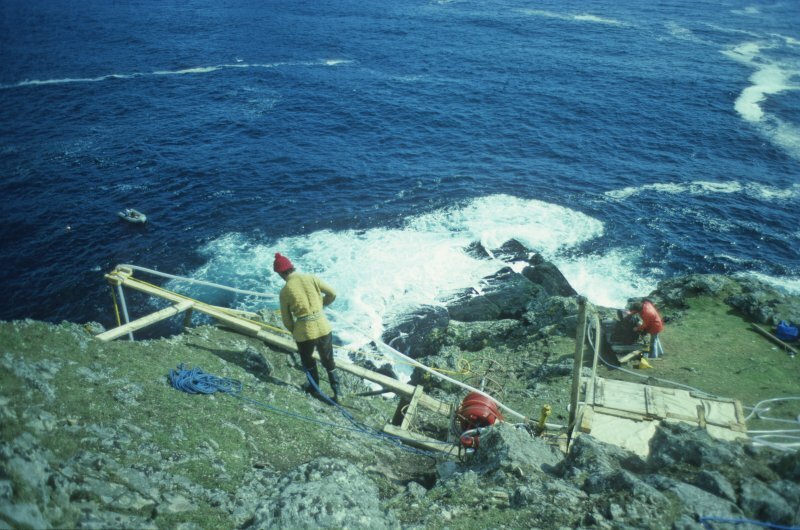 Further investigation in 1977 aimed to remove the extensive shingle deposit (about 200 cu m in all) and to investigate the site formation processes, which were found to be controlled by very strong surges under storm conditions. 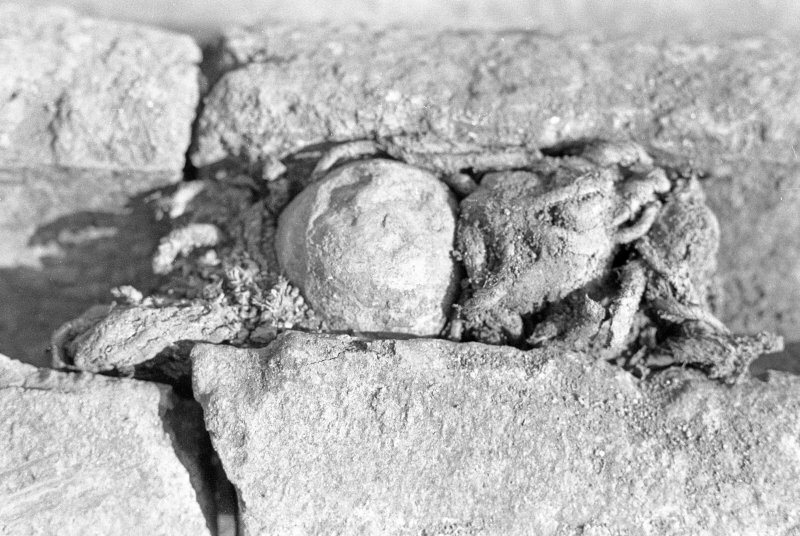 The severe churning and grinding action resulting from the movement of the shingle had destroyed all the pottery and softer materials carried and sectioned some of the ordnance which had been cemented into the underlying concretion layer formed by the chemical corrosion of the buried iron guns. The poor workmanship of the guns, the unexpectedly large quantity of shot surviving and the unstandardised range of ordnance carried were all noted. 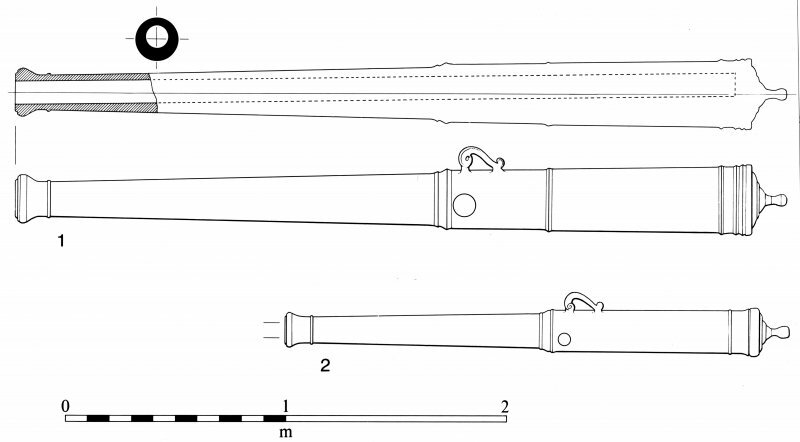 2.	broken end of culverin: muzzle length over all 26 ins [660mm] x bore 45/8ins [143mm]. (See detailed report SEA 1993.112 below). 3.	boat-shaped lead ingot, 23ins [584mm] long and marked on upper mid centre. (See detailed report SEA 1993.114 below). 4.	boat-shaped lead ingot, 24ins [610mm] long and marked on left upper surface. 8.	silver 4-Real coin of Philip II (Toledo mint). (See detailed report CUR 8246 below). 10.	lead ingot, rectangular with hole in centre, 23 x 10 x 2.5ins [584 x 254 x 64mm]. (See detailed report SEA 1993.115 below). 43.	lead ingot, rectangular with hole in centre, 24 x 9.5 x 2.5ins [610 x 241 x 64mm]. 44.	boat-shaped lead ingot, 23ins [584mm] long. (See detailed report SEA 1993.114 below). (See detailed report SEA 1993.113 below). 56. 5 iron round shot, of between 1in [25mm] and 4.5ins [114mm] diameter. 83.	tubular lead object, 2.5ins [64mm]. (This may be object described in detailed report SEA 1993.116 below). 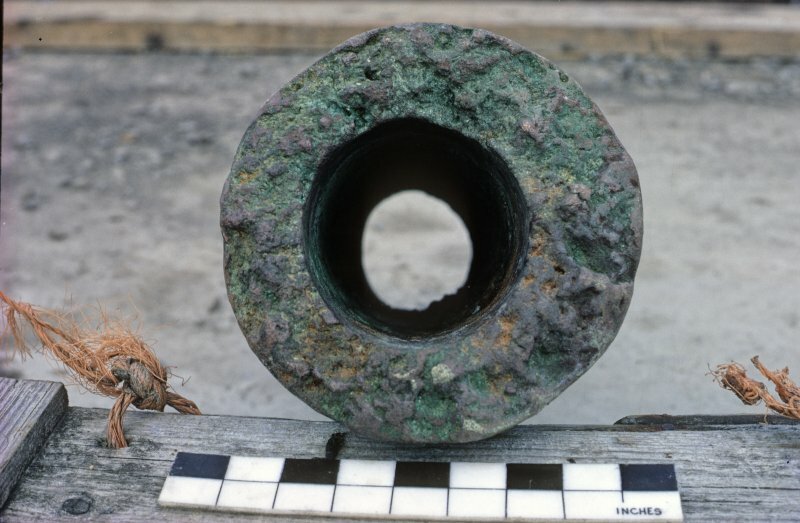 87.	iron ring-hoop from compound iron gun. 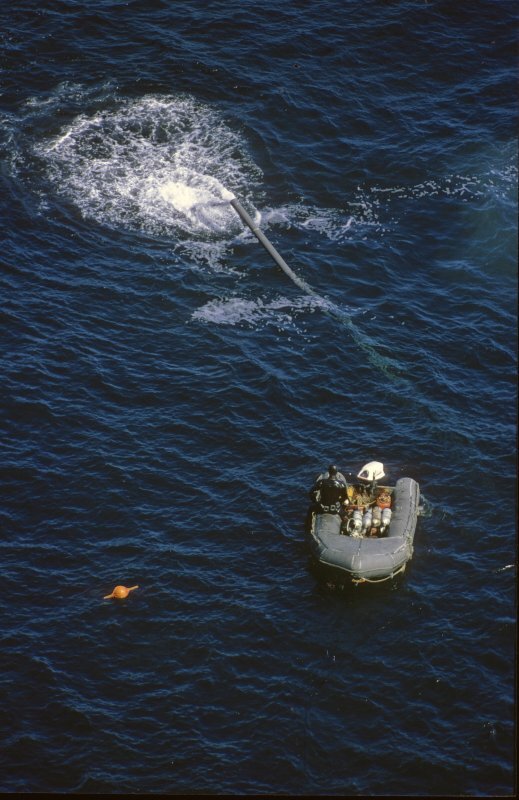 57.	bronze gun (culverin), 10ft [3.05m] long, with broken muzzle. (See detailed report SEA 1993.111 below). 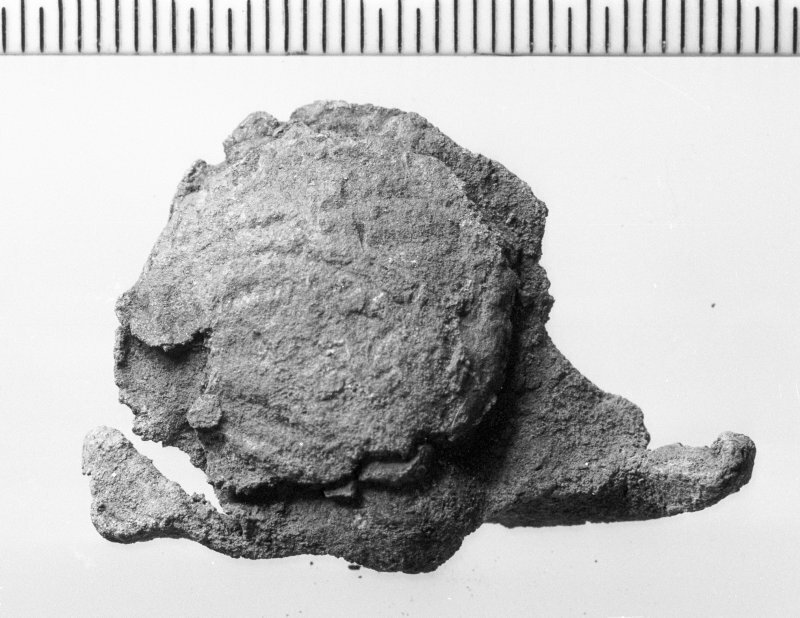 76.	degraded gunpowder (from breech block). Media Sacre Cannon (SEA 1993.111). Complete bronze gun with intact trunnions and dolphins: no decoration or inscriptions. This piece demonstrates classic culverin proportions, and amply shows off its family's considerable aesthetic appeal. The gun has a bore of 2.875ins [73mm], fired a 3.5lb [1.6kg] round shot of cast iron, and weighs 850lb [386kg]. When raised, it was found to be loaded with charge, ball and wadding. Muzzle-end, bronze gun (SEA 1993.112). From its proportions, this is very probably a media-culebrina. The pierce demonstrates both 'honeycombing' (the formation of gas bubbles within the metal) and a boring error of 1 degree (potentially causing serious asymmetry of wall thickness). Media-culebrina (SEA 1993.113). A bronze gun [apparently complete]. Boat-shaped, lead ingots (SEA 1993.114). Three lead ingots of three-sided form, narrowing to a point at each end. One is marked 'IIIVX' on the upper surface, another is marked 'X' on the upper surface, and the third is unmarked. Such ingots ('quintals') are characteristic of Armada wrecks, and were evidently intended for the manufacture of musket bullets or for use in ship husbandry; they are sufficiently small to be man-portable and might be taken ashore easily. [No weight or metallurgical characteristics cited]. Rectangular lead ingots (SEA 1993.115). Two lead ingots of rectangular form, each with a central circular hole; all are unmarked. Such ingots ('planchas') are characteristic of Armada wrecks, and were evidently intended for the manufacture of musket bullets or for use in ship husbandry; they are too large to be man-portable and could not be taken ashore easily. The central hole was apparently made by inserting a bar into the molten ingot to lift it from the mould, but would also serve to retain a slinging-strop. [No weight or metallurgical characteristics cited]. Oval lead ingot (SEA 1993.116). One flat oval lead ingot, with irregular edges and unmarked. The form of this ingot is unparalleled and it may be no more than furnace-residue. [No weight or metallurgical characteristics cited]. Silver coin (CUR 8246). 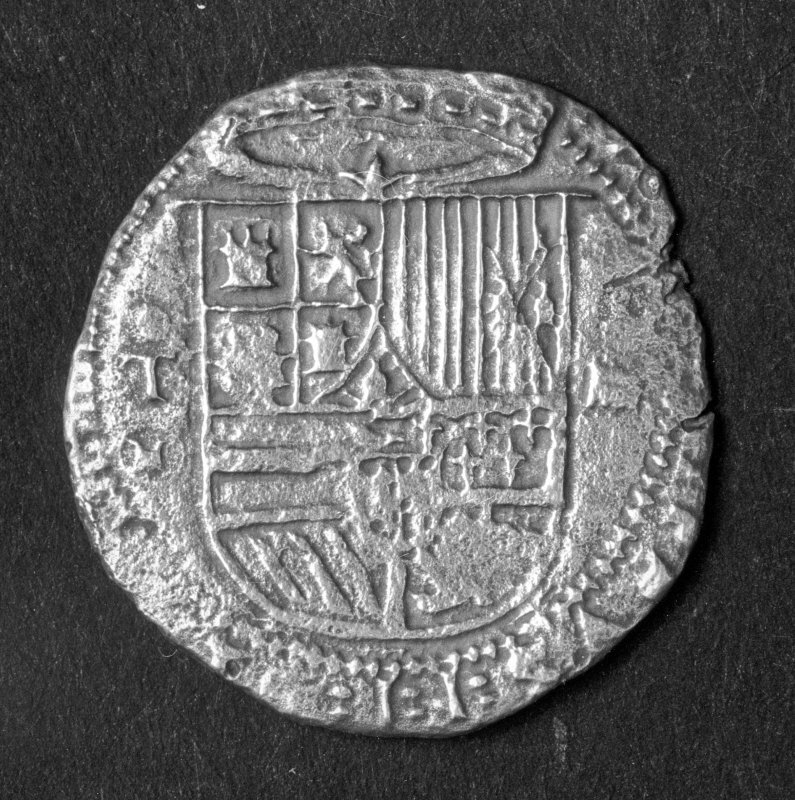 Undated Spanish 4-real piece of Toledo mint; this is the only coin found on the wreck. [No size, weight or metallurgical characteristics cited]. Obverse: Spanish coat of arms; legend illegible. Reverse: cross with lion rampant and castles in adjacent quarters. Candlesticks (HEA 74185). A pair of rosewood candlesticks, of 280mm overall height and 140mm base diameter. The lower part of each column is straight with a turned spiral, the upper part is fluted and slightly tapered. The candle-holder is missing from one candlestick; the other is a plain leaden tube with no drip-pan. They are of the Armada period. These artifacts were collected in Fair Isle by the donor's grandfather (Henry Isbister) in about 1870 and are said to be from the wreck; they were held in Edinburgh for over seventy years before their return and donation. Some chairs (referred to by Sir Walter Scott) are also said to have come from the wreck). 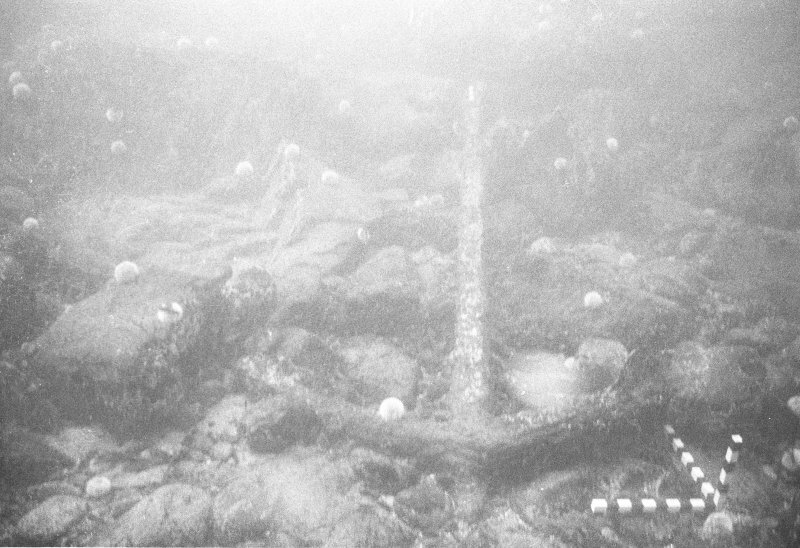 The indicated location of this wreck lies close inshore against the SE side of Fair Isle; neither the depth nor the seabed type is noted on the available chart. The area of loss is open to the E, SE and S.
Hydrographic Office chart no. 1119 (1982, revised 1993). El Gran Grifón was a Baltic hulk from Rostock engaged, like many other Hanseatic trading vessels, in carrying naval supplies to Spain during the run-up to the Armada campaign against England. In March 1587 she berthed at San Lucar, where she was embargoed to take part in the invasion of England. In due course she sailed to Lisbon, where the fleet was assembling, and on 7 May 1588 a muster shows that she had been assigned as flagship of the Urca (supply ships) squadron under Juan Gomez de Medina. She was rated at 650 tons and carried 38 guns, including 8 bronze pieces which were added at Lisbon. 286 men were listed on board when she sailed, 43 of them seamen and the rest soldiers. During the campaign she was hotly involved in the fighting on several occasions. She became separated from the main fleet during the ‘north-about’ retreat around the British Isles and was eventually wrecked on Fair Isle. Most of her people survived and after many tribulations some of them, including Gomez de Medina, returned to Spain. When they arrived at Anstruther in Fife a witness described them as ‘for the most part young beardless men, sillie, trauchled, and hungered’ while on passing through Leith it was noted that they had ‘saved their treasure and are come hither unspoiled’. Some salvage of the wreck was carried out in 1728, in the mistaken belief that it was the flagship of the whole Armada and carried a fortune in treasure. At least two bronze guns were recovered at this time. 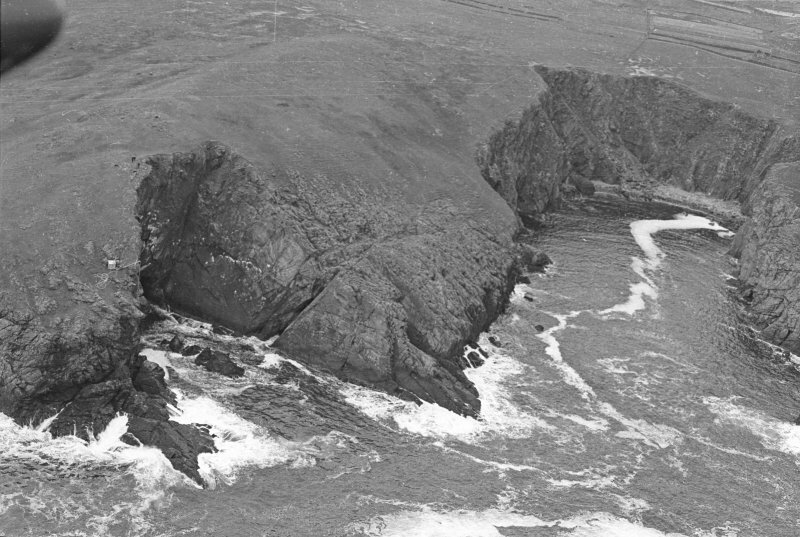 The wreck was remembered in island tradition until modern times, its site being pointed out by Mr Jerome Stout of Leogh to Colin Martin in 1970 as the cliff-girt creek of Stroms Hellier near the SE end of the island (HZ 211 700). 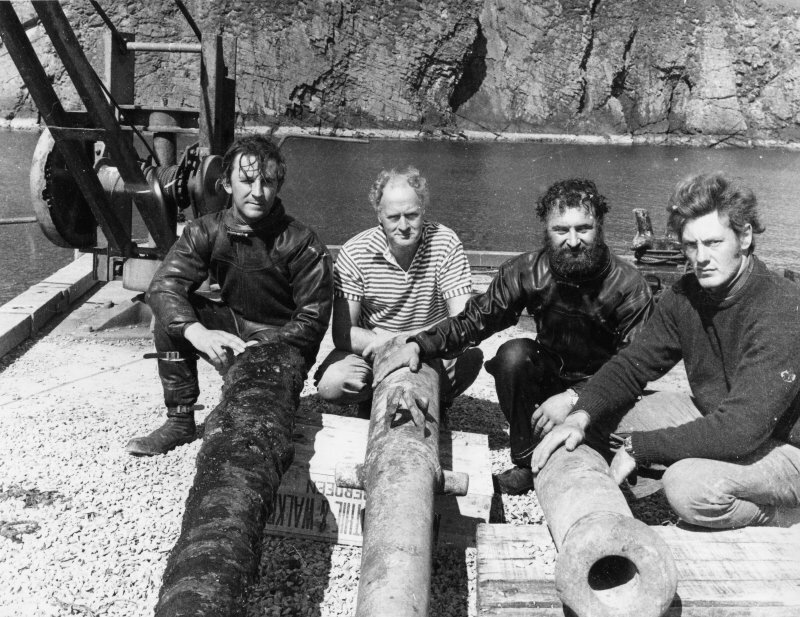 There, on 9 June 1970, the wreck was located on the SE side of the rock spine which runs through the central axis of Stroms Hellier by a team consisting of Colin Martin, Sydney Wignall, Chris Oldfield, and Simon Martin. 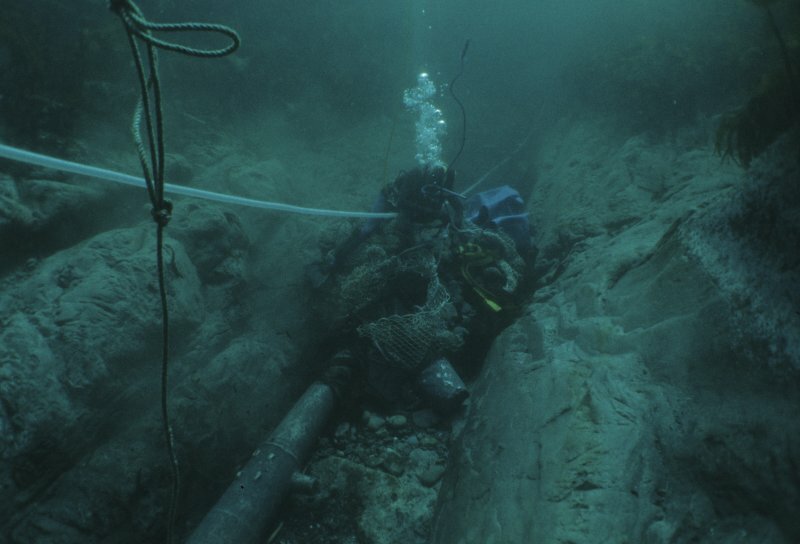 Shetland Council, which held a seabed lease of the site from the Crown Estates Commission, gave permission for excavation, which was conducted over the remainder of that summer. The work was strongly supported by the Shetland Museum, with which all recoveries were lodged through the good offices of its Curator, Mr Tom Henderson. Mr Henderson provided his skilled conservation services throughout the project. 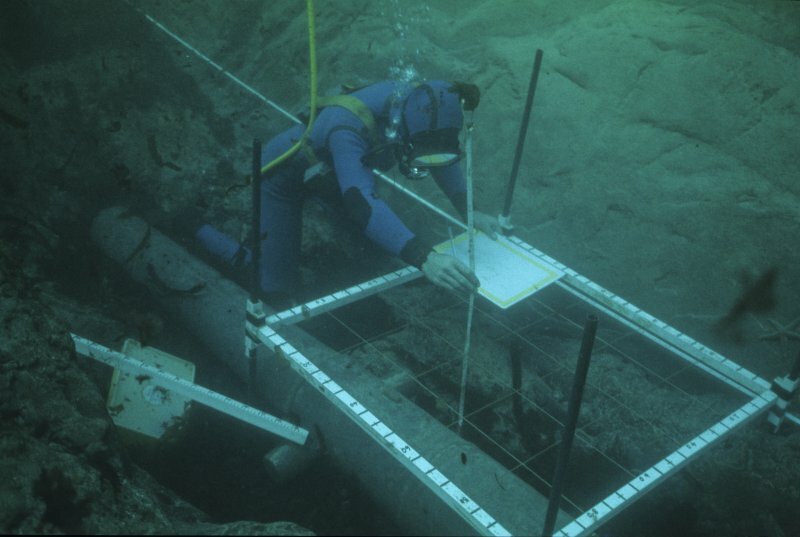 A short monitoring visit to the site was made by Colin Martin in 1974, supported by Alec Crawford and Simon Martin, and in 1977, under the auspices of the Institute of Maritime Archaeology at St Andrews University, a final season of excavation was conducted under the direction of Colin Martin. Other team members were Paula Martin, Keith Muckelroy, Tony Long, and Andrew Fielding. 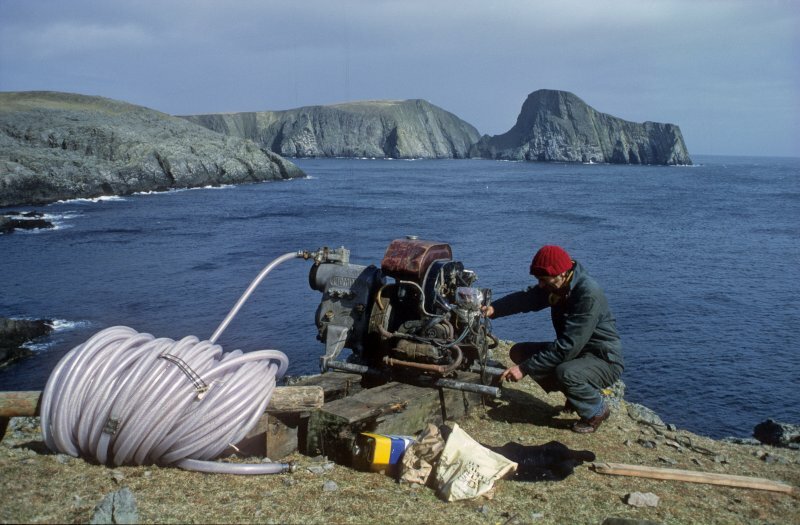 The 1970 excavation was focussed on the shoreward gully close to Point Saider on the south side of Stroms Hellier. This revealed a concentration of guns, including a bronze media sacre (about a 3-pounder) and the broken-off end of a larger-calibre bronze piece, identified as a media culebrina (about a 9-pounder). Three intact cast-iron pieces were also present, two of which were badly abraded. A fragment of a fourth was also found. The well preserved piece was stripped of concretion so that its profile could be recorded. Three wrought-iron pieces, two identified as iron-shotted esmeriles and a third as a stone-throwing falcon pedrero, were also recorded. Also present were three wrought-iron breech-blocks for light swivel pieces. The two bronze pieces, the breech blocks, one of the esmeriles and the falcon pedrero were raised for conservation and display in the Shetland Museum. Also recovered was one of the ship’s wrought-iron rudder pintles, a bronze sheave from a pulley block, a curved iron blade identified as a shear hook for cutting down an enemy’s rigging, scraps of brass and pewter, and a silver coin of Philip II minted at Toledo. Quantities of iron roundshot were also recovered. 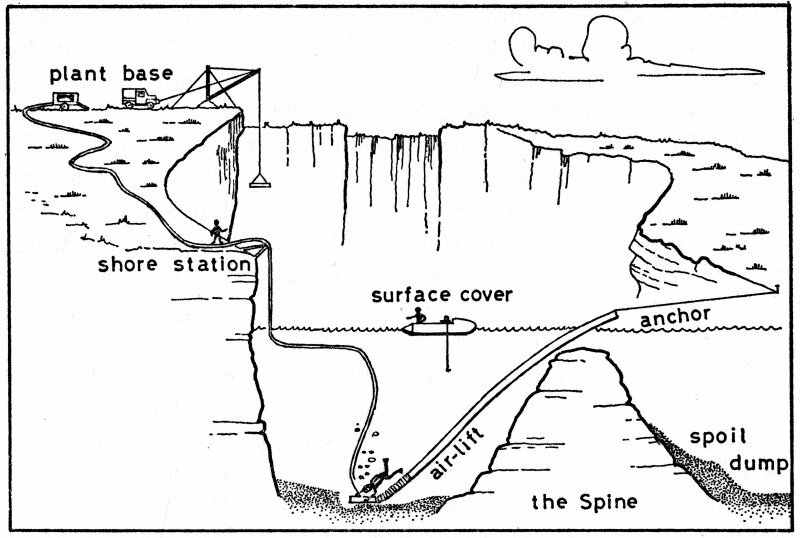 Attention in 1977 was focused on the long seaward gully lying on the SE side of the central spine. 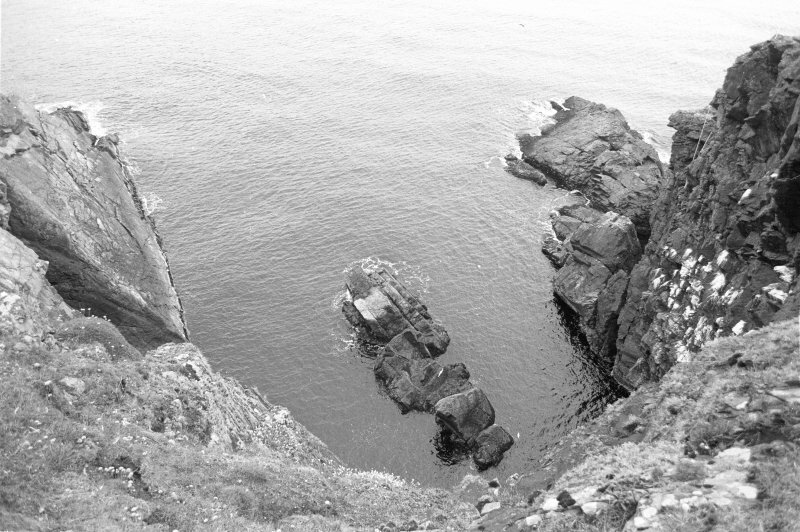 At its landward end the gully is narrow and its bottom largely free of shingle, revealing a much abraded and partially sectioned iron gun, four lead ingots, and pockets of lead shot gathered in crevices in the bedrock. As the gully widens to seaward its bottom becomes filled with shingle, soon extending to a depth of about 2m. It was decided to remove this shingle which, it was felt, would contain stratified material from the wreck. 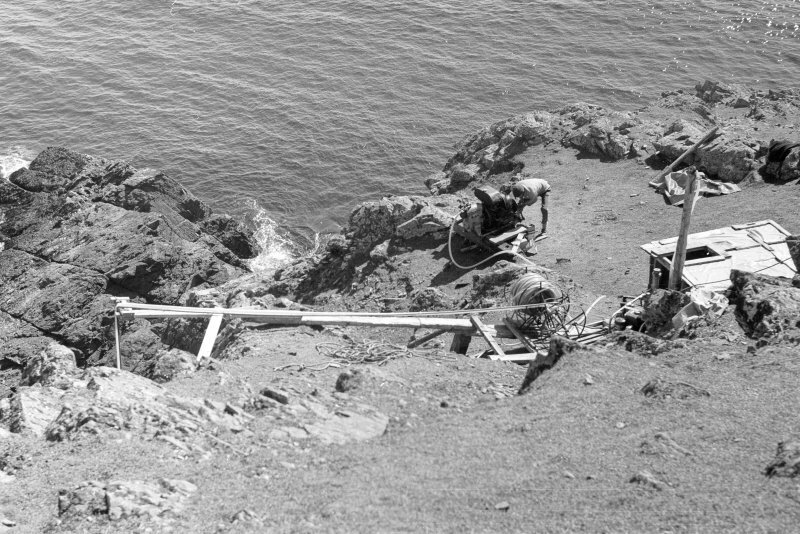 Since significant volumes of spoil were involved an air-lift, serviced by a compressor on the cliff top, was installed. 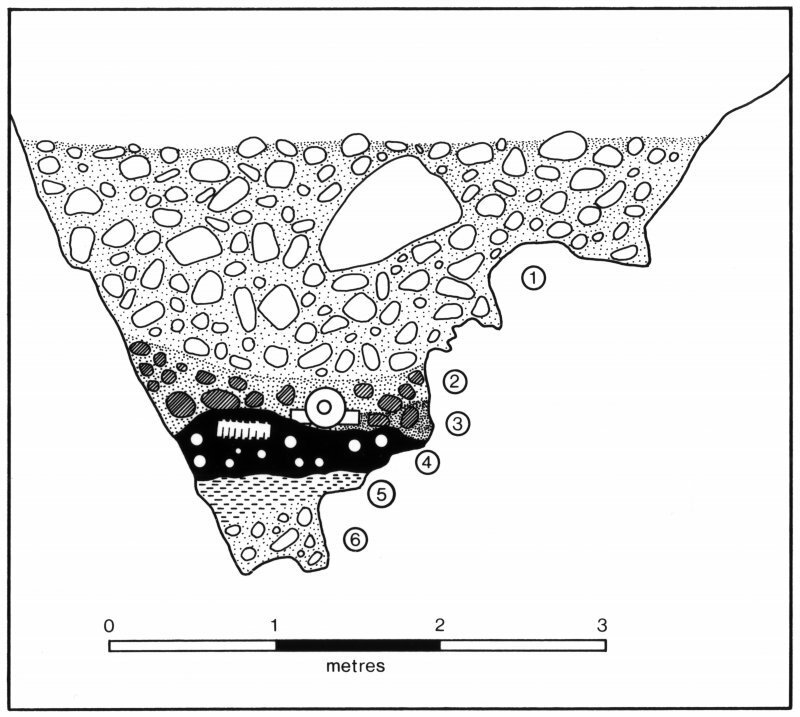 Initially careful excavation revealed that the shingle overburden was entirely devoid of archaeological material. Items from the wreck, mainly iron guns and roundshot but including two more lead ingots and more lead shot, had evidently worked their way through the shingle to the gully bottom, where they had stabilised and concreted into a continuous matrix. The surface of this matrix was in a constant/regular state of abrasion, apparently due to shingle movement in rough weather, revealing in its surface sectioned iron guns and roundshot. 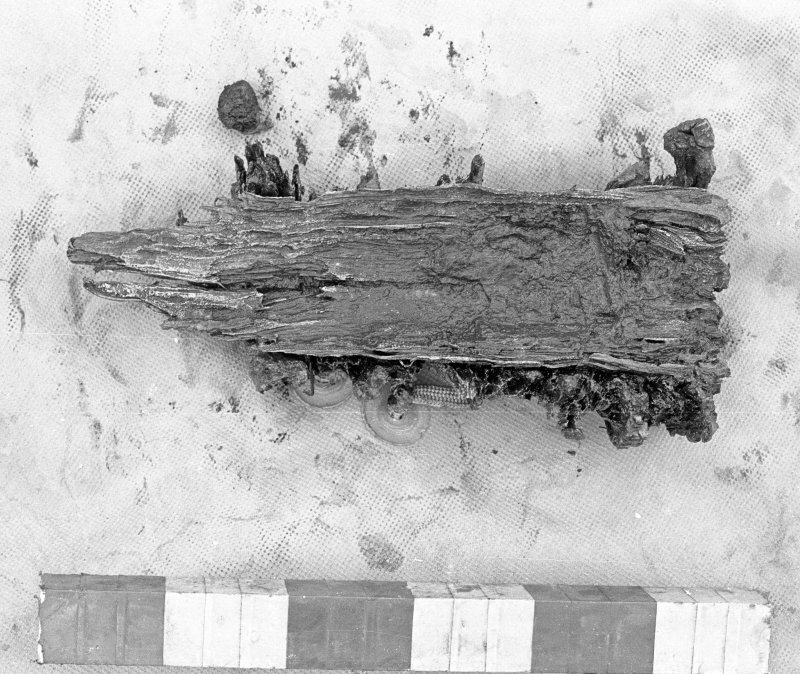 At one point the remaining part of the bronze media culebrina, the muzzle end of which had been recovered in 1970, lay on top of the matrix. There were also three wrought-iron breech-blocks for esmeril-type guns. 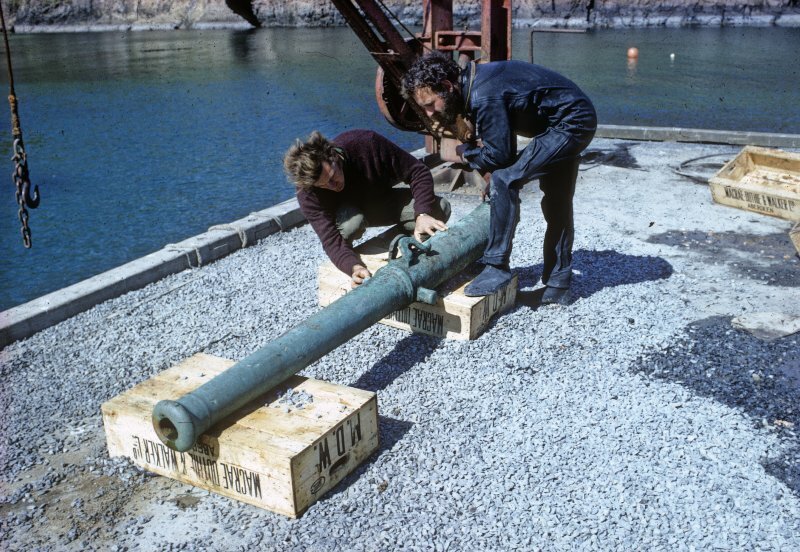 The iron guns were recorded in situ, the bronze piece and breech-blocks raised, and a sample of roundshot recovered for statistical analysis. 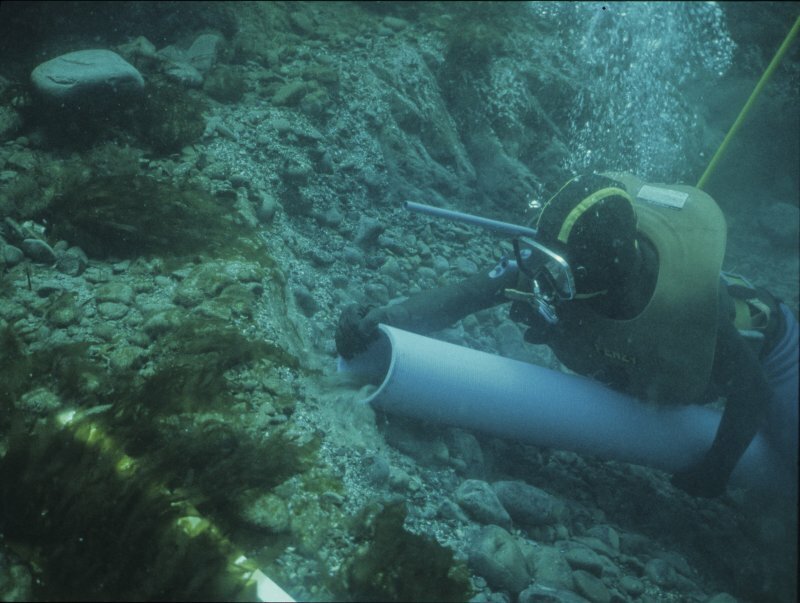 The paucity of small finds recovered is explained by extensive salvage at the time of of the wreck and during the 18th century, and by an extremely dynamic and abrasive site environment. Although we know from documentary sources and other Armada wrecks that large quantities of pottery were issued to the fleet, none whatever has been noted on the wreck-site. This can only be because its fragility and low mass, which would render it prone to natural movement within the shingle, has abraded it to nothing. However the varied collection of ordnance-related material has been of considerable significance in reaching a fuller understanding of the nature and effectiveness of Armada gunnery, especially in relation to its second-line ships (see Martin, 1983). All the recovered finds are in the care of the Shetland Museum. 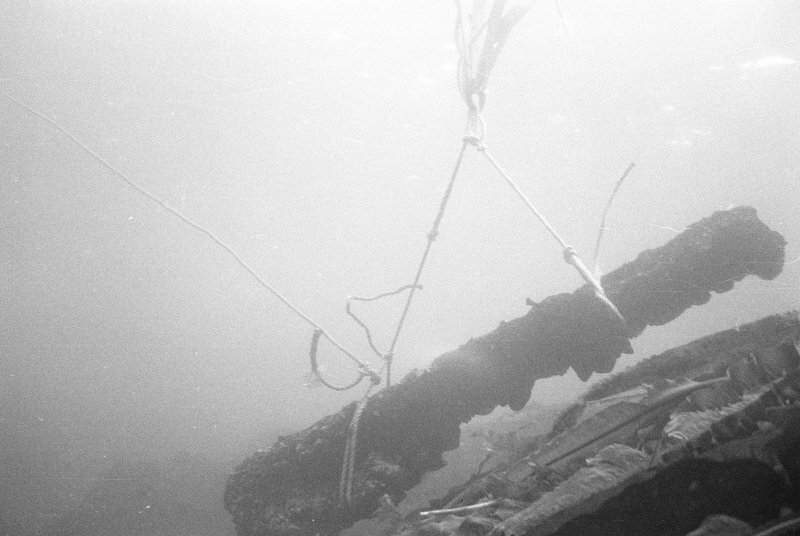 Martin, C., 1972, El Gran Grifón, an Armada wreck off Fair Isle, International Journal of Nautical Archaeology 1, 59-71. Martin, C., 1975, Full Fathom Five: the Wrecks of the Spanish Armada. London. 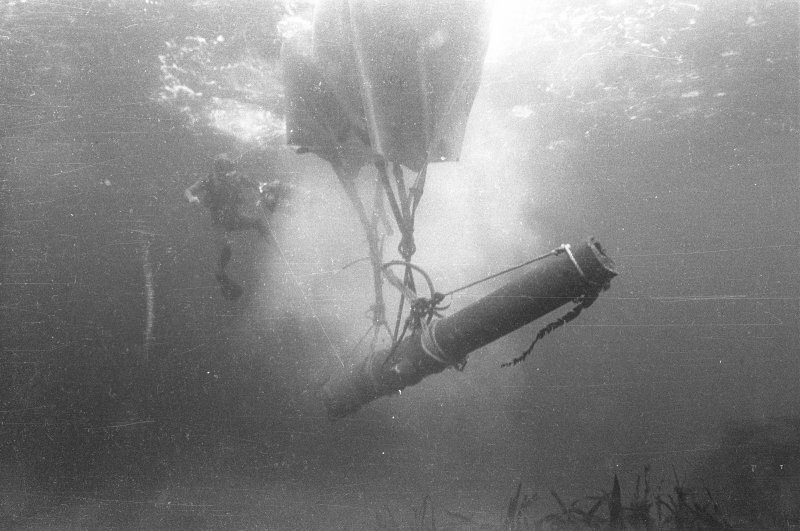 Martin, C., 1983, The Equipment and Fighting Potential of the Spanish Armada. Unpublished PhD thesis, University of St Andrews. Martin, C., 1998, Scotland’s Historic Shipwrecks, Chapter 2 (pp.28-45). London. Comment : Wrecked at Stroms Hellier, Fair Isle.